Check out our terrific toys for 2. Here are the best toys for 2 year olds that will channel their energy and that experts say will support their cognitive development. Two year olds are full of energy, jumping, running, and playing. They have already started to speak in sentences, using words to express their own feelings. With so many new skills, your 2 year old is just waiting to use them. As your child gets more active, they’ll take an interest in toys to pull, push, and throw around them. 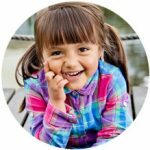 You’ll also want to look for toys that are challenging, like jigsaw puzzles, blocks, and toys that help kids identify colors, shapes, letters, and numbers. With a growing imagination, pretend toys will likely be a huge hit too. Whether you are looking for best Birthday gifts or Christmas gifts for boys or girls, we have taken away all the guess work. Check out the best gifts for 2 year olds. With a growing imagination, pretend toys are sure to be one of the top 10 toys for 2 year olds. 2 year olds love to imitate mommy and daddy, so why not give them their own kid versions. It’s time to play house with this fantastic 6-piece set! 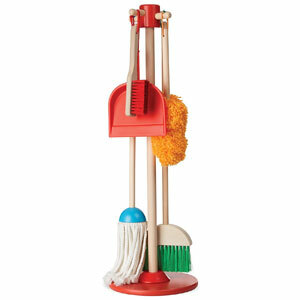 This colorful set features a mop, duster, broom and more for a realistic play experience. Toddlers will love playing house and cleaning like mommy and daddy. A convenient storage stand is included as part of the set. The durability of the pieces will ensure fun that lasts for years! 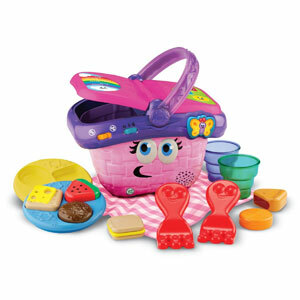 Picnic time is fun time with the Shapes & Sharing Picnic Basket set from LeapFrog. Fun colors and a cheerfulness are abound with this set. Picnic pieces include food items, plates, forks, cups, and more. 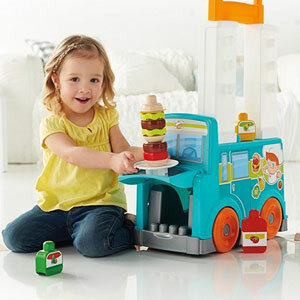 It’s an excellent set for toddlers to explore shapes, manners and colors while playing picnic. 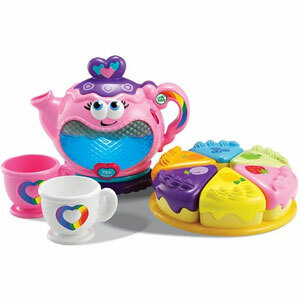 Here’s a nice magical twist from LeapFrog on the classical tea party toy. This interactive musical tea set makes hosting pretend tea parties even more fun thanks to its interactive features. Press the teapot button and watch the pretend water gurgle, bubble, and light up inside as the teapot sings happy songs. Once the tea is ready, tip the teapot over for fun pouring sounds. There is pretend cake to go along with pretend tea. The coolest part? The tea level behaves realistically as you pour the tea. 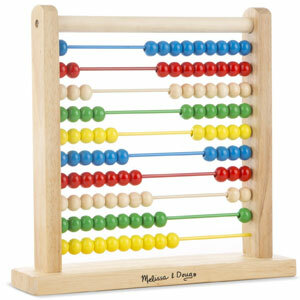 This colorful classic toy is sure to bring a smile to your toddler. It’s all about pounding and learning about cause and effect in the Deluxe Pounding Bench. This toy is made of durable wooden construction ensuring a lifetime of fun. 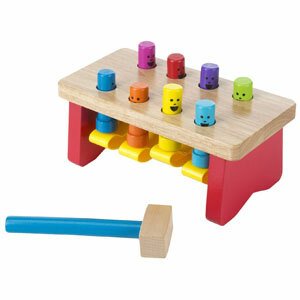 Kids will enjoy hammering away on the pegs that appear to play peek-a-boo with them. Cook up some imaginary fun with this realistic stainless steel pots and pans set from Melissa & Doug. Wooden utencils provide for realistic play. 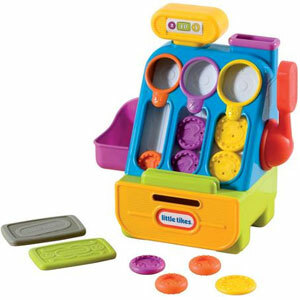 It’s perfect for toddler kitchen pretend play. 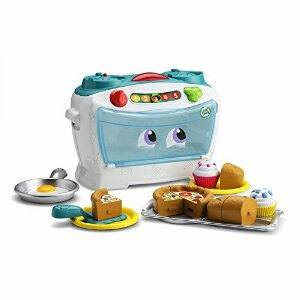 Combine this set with pretend play food, a pretend play kitchen set, and chef role play dress-up set to enhance your play experience! Kids love playing with the remote control. It’s probably just natural instincts. Get ’em a remote control of their own. 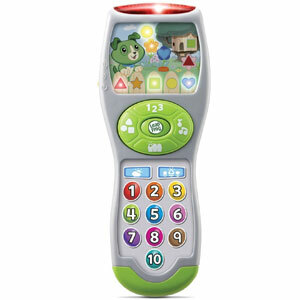 The Learning Lights Remote features fun learning like first words, shapes and numbers on every channel. 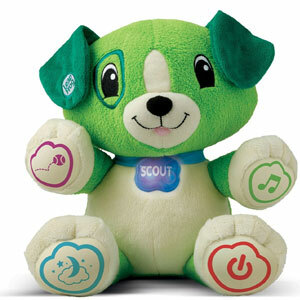 Toddlers will be entertained with over 65 songs, tunes, and phrases from their pal Scout. Bold colors and over 10 lights promote exploration. Even play shape games and learn about weather. It’s the perfect toy that teaches through imitative play. Toddlers love shopping like mommy and daddy, too! With this cute hybrid design with a shopping cart and Cozy Coupe, kids can push along the shopping cart and add toys and other small items as they shop. Additionally, a 12-inch doll can ride along in the Cozy Car seat. Two styles are available. Additional storage is located below the basket. This toy is proudly made in the USA and it’s built to last! The Number Lovin’ Oven delivers learning fun for toddlers. Little chefs will enjoy counting, cooking, serving, and sharing with 16 fun ingredients. From a slider that teaches numbers and temperature to the 16-piece set that talks, sings, and builds number skills to over 30 phrases and songs that introduce counting and sharing skills, it’s the perfect recipe for number learning fun! Say “Ah.” Make checkups fun with this med kit from Kidzlane. 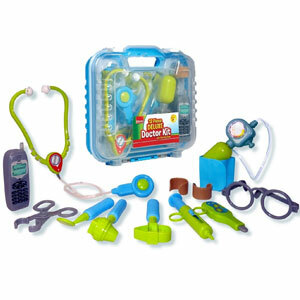 Your little Dr. can race to the scene with this medical kit. 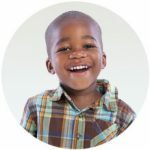 Tots will have everything for make believe checkups including a stethoscope, otoscope, thermometer, and syringe. 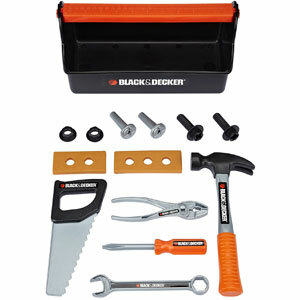 Featuring 14 realistic tools and accessories packed in a handy tool box, the Black & Decker Jr Tool Box introduces your toddler to the world of tools. The sense of realism will heighen your child’s play experience. They can become the new handy person around the house. The tool box includes a hammer, screw driver, play saw, wrench, pliers, and more. It’s a great tool box for all your little one’s projects. This shopping cart from Melissa & Doug looks like a miniaturized version of a real shopping cart. It’s even got a little area for dollie. 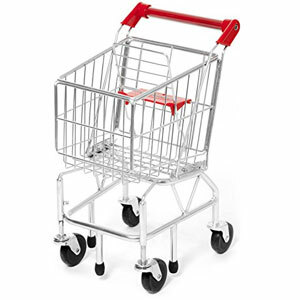 Just like a real shopping cart, it’s made of very sturdy metal and wheels swivel easily. You would think it belongs in a grocery store. What role play fun! The bowl, ball, bottle, and comb promote role play. The soft, cuddly puppy fits perfectly in the carrier. Toddlers will learn colors, numbers and develop nurturing and fine motor skills. When kids open and close the carrier, the pet responds with fun phrases. 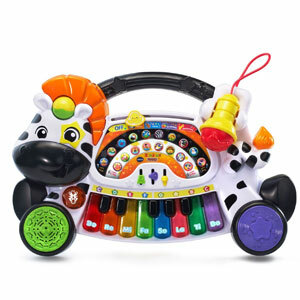 The toy even entertains with over 100 songs, melodies, sounds and phrases. Would you like some tea? 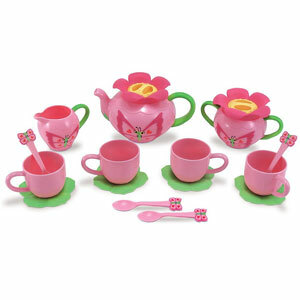 This 17 piece tea set from Melissa & Doug is pink with butterflies on it. It’s perfect for hosting pretend tea parties. 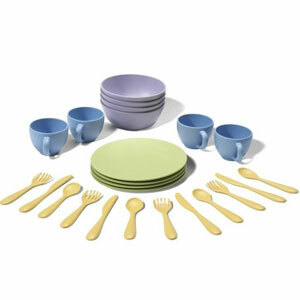 Made from 100% recycle milk jugs, this eco friendly 24 piece dish set from Green toys is perfect for serving pretend meals. There plates, cups, bowls, and food utensils. We love the gender neutral colors. Kids will love going on pretend picnics, serving pretend food, and even pretending to wash them. Best of all, they are even safe to eat with. 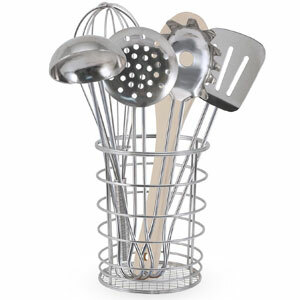 This stainless steel and wooden cooking utencil set is perfect for cooking up some fun. The set looks realistic which adds to the fun. 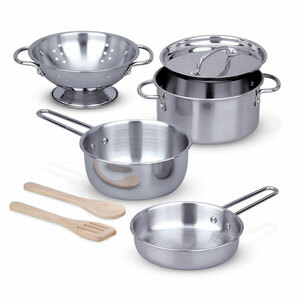 Coordinate this set with the Melissa & Doug Stainless Steel Pots and Pans set to enhance playtime. 7-piece set includes whisk, ladle, spatula, slotted spoon, spaghetti server, wooden spoon and a handy storage container. Cha Ching! This pretend cash register from Little Tikes has a ton of levers to pull and push. It’s great for little ones who are just learning about colors and counting. Kids will spend hours putting the coins through the slots. Pull the lever and the cash register draw opens up with a clang. But who uses money these days? There’s even a credit card to slide across that will empty the coins into the register. Sort of like mommy’s and daddy’s. 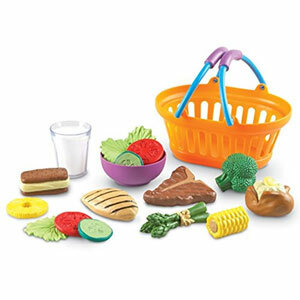 This dinner basket and play food set is fantastic for acting out dinner traditions. The 17 food pieces are durable, high-quality, and look highly realistic which will translate into an enhanced play experience. The pieces are perfect for little ones to play with. 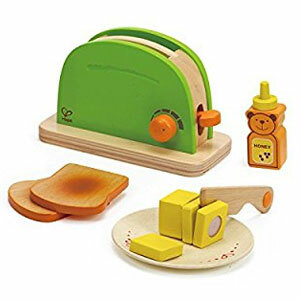 Serve up some breakfast fun with this fantastic wooden toaster kitchen set from Hape. Toddlers can make the toast and apply imaginary butter and honey to start the day off right with the most important meal of the day! The butter slices with the wooden play knife for enhanced play. Promotes fun, creative role-play for little ones. Who knew mowing the pretend lawn could be so fun? Pull the cord to rev up the motor. As you push the toy forward, the balls inside pop. It’s perfect for mowing the carpet or on flat surfaces. Too bad it doesn’t actually cut grass like mommy’s or daddy’s. 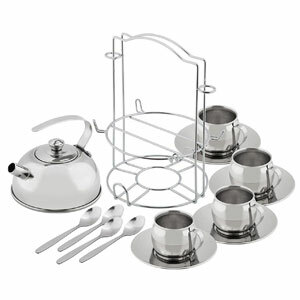 This stainless steel tea set is perfect for a toddler or preschooler tea party. It’s perfectly sized for little hands to serve tea to their toy friends. Since they are free from BPA, they are safe for your children. What’s great is that it’s safe to use with real tea. A handy caddy allows easy organization of your tea set and the set is dishwasher-safe. 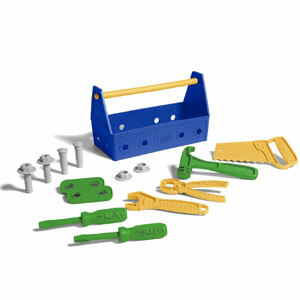 This toolbox from Green Toys is perfect for your little tool man or tool girl. Offered in both pink and blue, your little handy helper has everything they need for creating pretend projects. There is a hammer, wrench, saw, pliers, screwdrivers, and screws. 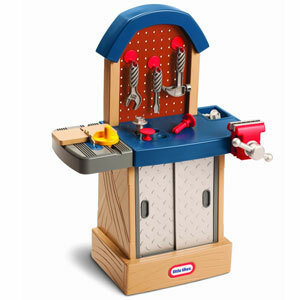 Kids will love breaking this set out when mommy or daddy is tinkering around the house. Now kids can have a snowball fight anytime of the year! 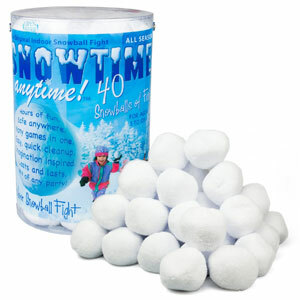 With this 40 pack of snowballs that looks and feels like snow, your snow fights will be extra fun! They are safe as they are made from soft material. It’s fun that lasts and lasts. If you haven’t yet discovered what millions have already discovered – what are you waiting for? The Elf on the Shelf is a Christmas tradtion. Discover this timeless holiday tradition that the whole family can enjoy. The book is beautifully illustrated and comes with either a boy scout elf or girl scout elf. It’s your choice. Todders will love hearing the story and acting out their very own holiday adventures. This Santa Sack is perfect for delivering all of your Christmas gifts and presents. 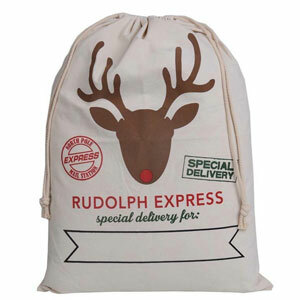 The bag features a Rudolph Express Special Delivery design. The bag measures 27″ x 19″ and can wrap a large gift or multiple smaller items and parents can personalize the Santa Sack with their child’s name to create a special feeling during the most happiest time of the year! 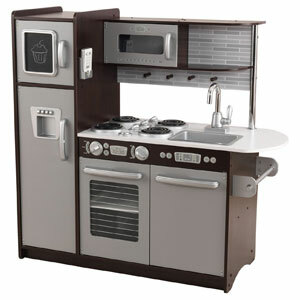 Let your 2 year old cook dinner while you do with these fun pretend kitchens. The Little People have a farm. E-I-E-I-O. 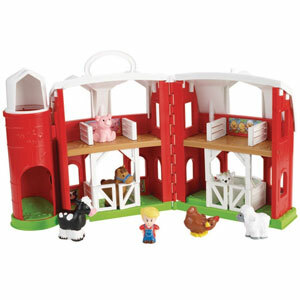 This colorful farm play set offers tons of pretend play with cute animal sounds and music. Your little farmer with love rounding up the different animals. There’s a pig, horse, sheep, cow, chicken, and goat. Kids can put each animal in its stall, matching it to the pictures. As little ones open and close the doors, kids will love hearing the different animal sounds. Life on the farm is so fun. 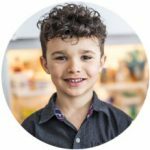 Do your kids love playing in the kitchen? 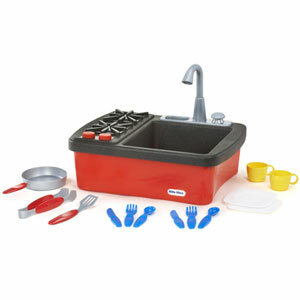 Splish splash, cook up some fun with this kitchen and stove toy with an actual working faucet. With 13 accessories, there are a ton of accessories to stir up little imaginations. Designed with gender neutral colors, both boys and girls can play. The stove features turning knobs that click similar to the real thing. The best part? Fill the base with water and pump out the water from the faucet. Washing dishes has never been more fun. The Uptown Espresso Kitchen features a modern and realistic look. This will lead to enhanced kitchen play with opening and closing doors and realistic styling. The set features all the kitchen appliances you have at home from a refrigerator and dishwasher to a stove, oven, microwave. There is even a faucet and sink with a working handle, storage space, and a paper towel holder. 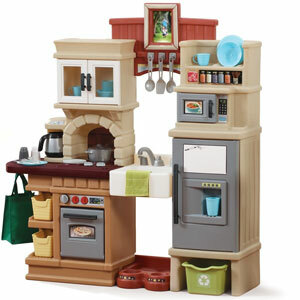 Toddlers will enjoy years of fun with this spectacular kitchen playset. The Little Tikes Touch Workshop comes with all the pretend tools for building your child’s imagination. All of the tools can be neatly stored on the hooks. The sliding door below the workbench holds even more stuff. The coolest part? The pretend saw really saws the magnetic wood pieces. Even daddy and mommy will want their own. 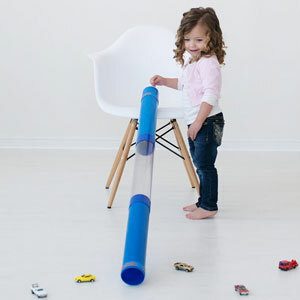 Toddlers will love this toy car and ball tunnel ramp race track. Race balls or cars down the 45-inch long track and watch in awe as they zoom through the transparent section of the tube for endless fun! The track is easy to assemble and you simply prop it up on a couch or chair. What’s great is that any toy car brand or small ball works. So your Little People, Hot Wheels, or Matchbox cars work. 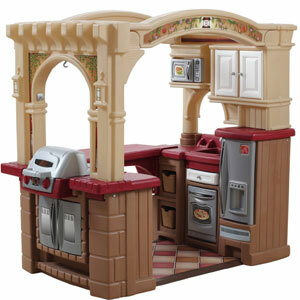 This play kitchen is like a grand palace for little ones. It’s like a little home that basically replicates the entire kitchen right down to smallest details like a phone. Kids will love giving you a tour around. All of the cooking areas come to life with fun noises and lighting effects. Even the little cabinets open up for storage space. There’s a grill in the front, a microwave, stove, and refrigerator. The play kitchen comes with a ton of dishes, cookware, and plastic utensils. With its high end look, mommy and daddy will wish their kitchen looked just as good. Cook up some fun with the Step 2 Heart Of The Home Kitchen. It features a kid sized refrigerator, microwave, and stove top. Kids will love putting their photo or art work in the photo frame. With its design, there is plenty of counterpace for multiple kids to play together. Kids can cook on the stove as food makes bubbling and sizzling noises. The kitchen comes with all the accessories you need including pretend food. It might just become the heart of playtime. 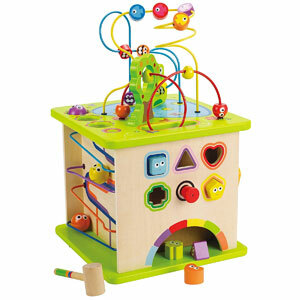 This colorful and playful activity center offers plenty of activities to keep your toddler engaged. With animal friends, wooden balls, shapes, and more, it will encourage story-telling and imagination. The wooden cube is made from high quality, non-toxic, and child-safe materials. Count on endless hours of fun and delight. With two ways to play, this 2-in-1 Food Truck transforms into a kitchen with pantry, stove, and grill. 30 play pieces include blocks, plates, frying pan, spatula, and more add to the overall play value. Toddlers will love serving up imaginary meals by the curbside. It’s a great set for early childhood development. Dress-up gives 2 year olds the ability to use their imagination in fun ways. This purse is one of best gifts for 2 year old girls. 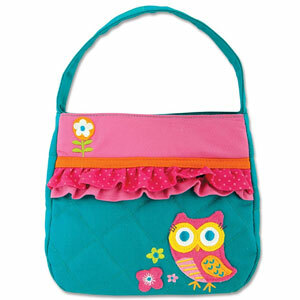 Your little girl will adore carrying this little purse around with her pretend toys and candy. It will make her feel all grown up. Choose from several designs that will make your little one feel like a princess. 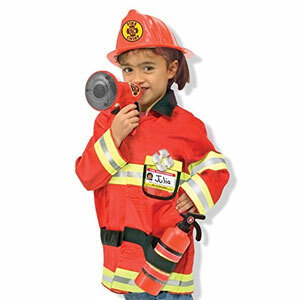 This fire chief costume from Melissa & Doug will inspire fantastic role play thanks to the realistic and colorful design. The costume comes complete with a durable jacket, working bullhorn, fire extinguisher, hard hat, badge, and more. The costume is durable and crafted of high quality for years of role playing fun. 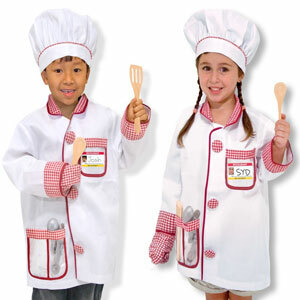 Budding little master chefs will love this chef role play costume from Melissa & Doug. The costume includes a chef coat, hat, mitten, wooden utencils, and more for playtime fun! The costume looks realistic for an enhanced play experience. 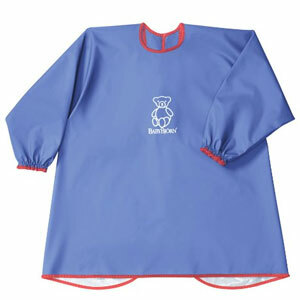 It features quality construction and chef coat is machine washable for years of pretend play fun. Every city needs police officers to serve and protect the community. 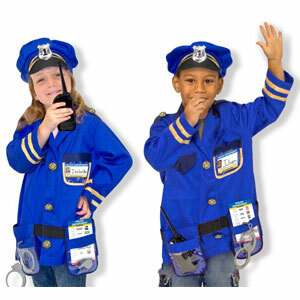 This fantastic police officer role play costume includes everything for your toddler to look the part from a jacket and cap, to a whistle, badge, walkie-talkie, ticket, and more. It features high quality workmanship and the costume is machine washable for years of imaginative play. Budding little doctors will love playing the part of a doctor with this fun role play costume from Melissa & Doug. The costume is constructed of high quality materials to ensure durability and safety of your toddler. Costume set contains jacket, mask, stethoscope, syringe, and more. Both the jacket and mask are machine washable for years of fun imaginary play. For those toddlers daring enough to boldy go into space, the Aeromax Jr. Astronaut Suit is perfect. 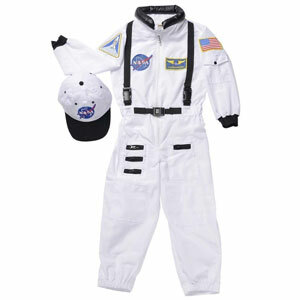 The astronaut suit features an authentic look with embroidered NASA and USA flag logos. It also features realistic details such as zippers and shoulder and waist harness straps. The machine-washable suit features high quality construction that will last for years of fun imaginative space missions. Beauty and the Beast fans will love playing the lead role of Princess Belle in this fancy costume inspired by the movie. It’s a gorgoeus off-the-shoulder dress featuring four layers and a beautiful rose on the chest in Belle’s signature color. 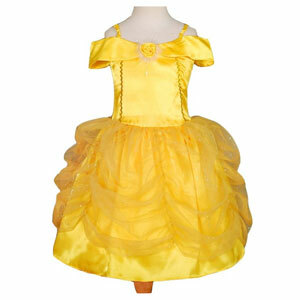 Little girls will relive the enchanting tale of Beauty and the Beast in this wonderful and magical dress. 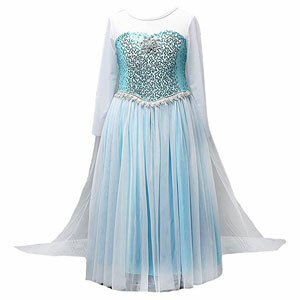 Frozen will love the enchanting Elsa floor-length yarn dress costume inspired by the film. It looks lovely with beautiful design perfect for little princesses. 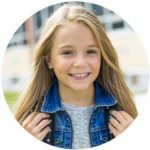 Girls will love acting out their favorite scenes from the movie for fun, imaginative role play. 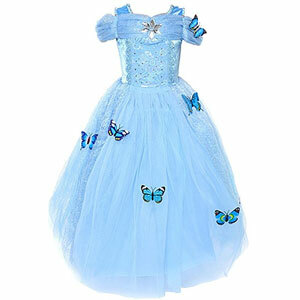 Little girls will be magically transformed into a beautiful and enchanting princess with the Cinderella Princess Butterfly Dress Costume from Loel. The dress features a gorgoeus design featuring butterfly appliques for magical role play experiences. Relive the magic of Cinderella with this fantastic role play costume. Looking for the best gift for a 2 year old boy? A vehicle is a safe bet. Whether your 2 year old loves cars, trains, trucks, or planes, these are the best toys that go vroom. 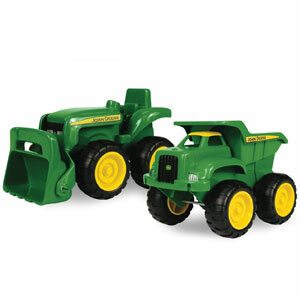 Your little truck driver won’t be afraid to get down and dirty with this 2 pack of vehicles featuring a John Deere dump truck and tractor. The dump truck can actually move and dump sand. Small enough to fit in your hand, they are nice and chucky for small hands, making them great for sandbox fun. Featuring over 50 sing-along songs, sounds, and phrases related to camping, it’s perfect fun for toddlers. There are six different ways to activate these interactive features. One way is by simply rolling the camper into adventure. The campfire glows for some fantastic imaginative play. For on-the-go play, everything conveniently stores inside the camper. Great way for kids to learn about animals, camping, fishing, and more. The Paw Patrol Paw Patroller is the best rescue vehicle in Adventure Bay. The playset includes Ryder and his ATV for action-packed rescue misisons. 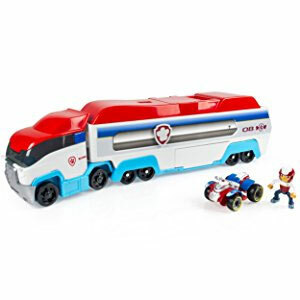 Transport up to 3 Paw Patrol vehicles or display six vehicles when open. 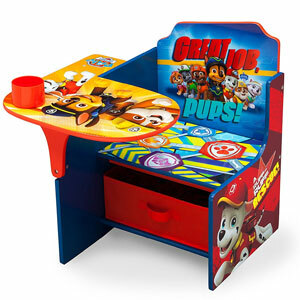 It’s the perfect set for reenacting your favorite Paw Patrol rescue missions! 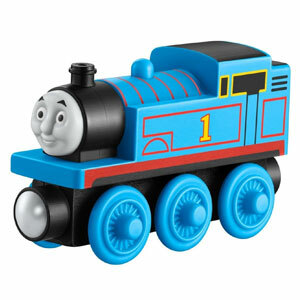 Designed for even the littlest Thomas fans, this wooden Thomas train is the perfect way of introducing him to Thomas. The best part? This wooden train is compatible with other wooden train sets so he can easily expand his collection. The chunky train is perfect for little hands. It’s all powered by your little one’s imagination. 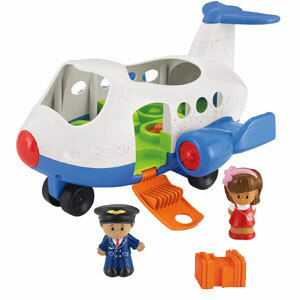 Let your child’s imagination take off with the Little People Lil Movers Airplane from Fisher Price. This adorable airplane will inspire lots of pretend play with its built in sounds and music. It comes with two Little People: the pilot and Mia. Load the pretend luggage in the plane and place the Little People inside. Roll the plane forward and back to hear the fun song before soaring into the air. The Little People Sit ‘n Stand Skyway is a thrilling set for toddlers. 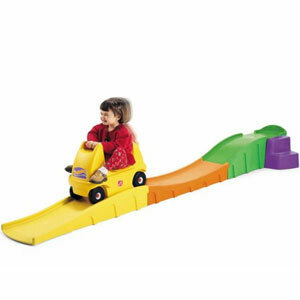 It features a winding track and two Little People Wheelies cars. 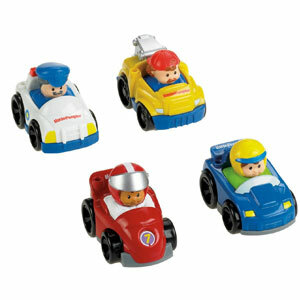 These Wheelies race down the track for awesome playtime fun! The coolest part is that there are two great ways to play. The stand-up tower stands over 3-feet tall. The other sit-at-roadway configuration allows for a different play experience. With both modes you can have role play vehicle fun. It’s a wonderful gift for toddlers. This is a fun Little People Wheelies set where it’s all about racing! Do you have the need for speed? Start your engines and go for the gold! This set of four Wheelies is perfectly sized for little hands. It’s a fantastic set for promoting imaginative racing play. What’s cool is that they are compatible with Little People sets like Stand ‘n Play Rampway or Zig the Big Rig. 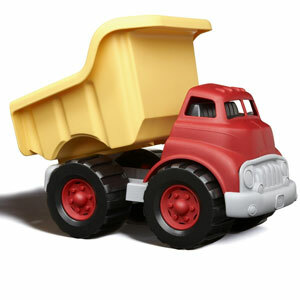 This award winning dump truck with large wheels has no trouble hauling any load. Offered in pink or blue, kids will love filling the dump bed up with toys, sand, rocks, or little treasures and then dumping out the load. Best of all, it’s made of 100% recycled plastic and designed to take punishment. For some semi-trailer truck action, this set from Melissa & Doug is perfect. The set features a semi-trailer truck with a magnetic car loader. The set is made from durable wood construction for long-lasting loading and unloading fun. Set includes semi with magnetic arm, trailer, and four magnetic wooden cars. The numbers printed on the vehicles encourage counting and sequencing fun. 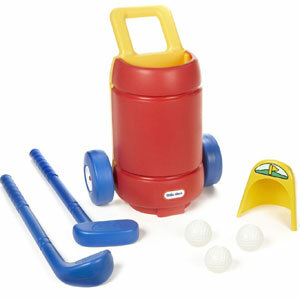 The set promotes eye-hand coordination and develops fine motor skills. 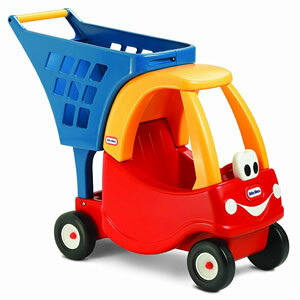 The Pull and Learn Car Carrier is a fun educational pull toy for your toddler. As your toddler pulls the toy, it interacts with them. Three interactive animals and three interactive vehicles add to the experience. A cool feature is the CB radio that teaches numbers, colors, and music. Kids can even learn about animals. Playtime and learning just kicked into overdrive. This cute and colorful RC race car is one awesome ride. Control the vehicle forward, reverse, left, and right with the steering wheel controller. The cartoon car is a quick racer, creating thrills for your little racer. Cool features include honking sounds, flashing headlights and music! It’s the perfect first RC vehicle for toddlers. 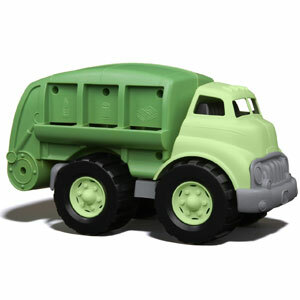 Tots can literally save the Earth with the Green Toys Recycling Truck. It’s a fairly large truck that is solidly constructed from 100% recycled plastic milk containers. The coolest part? The box comes with cardboard cut outs of little cans, bottles, and newspaper. Kids can put these cutouts through the various chutes on the side of the toy. Then lift the recycling bed to tilt it up, which opens the rear door, dumping the contents out. 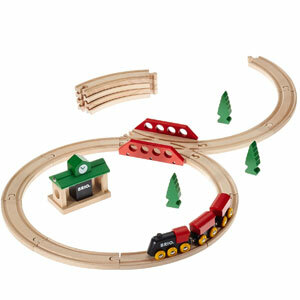 You can’t go wrong with this classic train set from Brio. It’s a nice little starter set for your budding engineer. 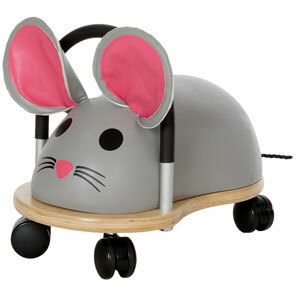 Kids have enough of electronics so why not give them something with no batteries, motors, or flashy lights and sounds. This train set includes 22 high quality pieces all made of wood. It can be combined with other Brio sets to make a larger set. We are going to the moon. Made from 100% plastic milk jugs and in the USA, this spacecraft will help your little one’s imagination take off to new heights. The spaceship has a detachable top and two little astronaut friends. 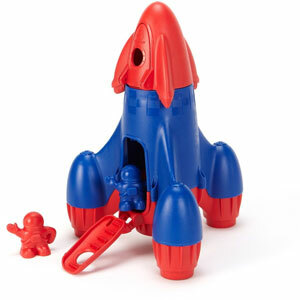 The entire rocket is powered by your tot’s imagination. How far will it go? 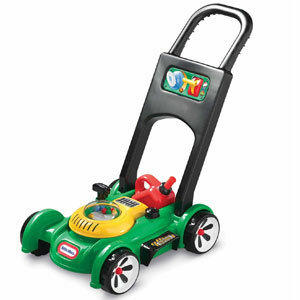 Let your 2 year old play with a push or pull toy as he or she walks around the house. Give them something to look at with these fun gifts- something that flaps, wags, bobbles, or squeaks. Walking a puppy has never been this fun. 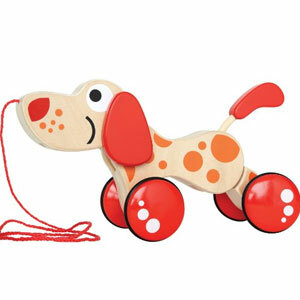 As kids pull this wooden dog forward, his whole body animates just like a real dog, wagging its tail behind and swinging its ears. The range of motion is superb for a wooden toy. Not only is it adorably cute with a solid build quality, but it might become your kid’s best friend. 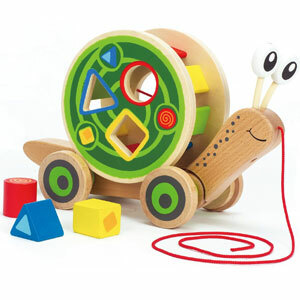 Kids will love pulling this adorably crafted wooden snail from Hape forward as his shells spins round and round on his back. The shell doubles as a shape sorter for shape sorting fun. Kids are learning new things and growing so much every time they play. When you are looking for the best educational toys for 2 year olds, you want toys to support their developmental needs including learning about shapes, colors, letters, and sounds. 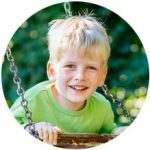 We selected the best learning toys for 2 year olds from classic learning toys to electronic gadgets. 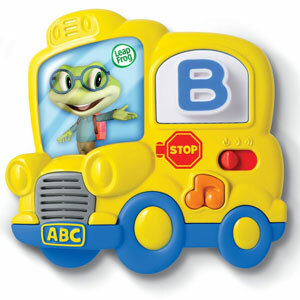 The LeapFrog Fridge Phonic Magnetic Letters is one of the best and fastest ways to learn the alphabet. With 26 different letters and a little cute school bus, everything is magnetic and sticks on the fridge. When you stick one of the letters in the school bus window, the cute bus will sing a fun song that reinforces each letter through repetition and pronunciation. 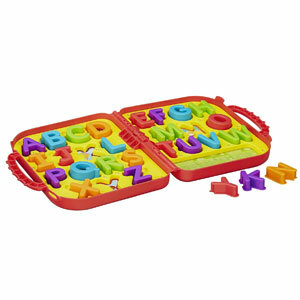 This is a fun and colorful ABC set to make learning the alphabet extra fun. Toddlers will love learning the alphabet with this set. Each letter has a place in the Elmo branded case. A convenient handle allows you to take it on-the-go for learning fun. This classic toy is hand constructed from wood. It helps add a little fun and color to math by helping children visualize the concepts. It’s a great way for teaching basic math concepts like addition, subtraction, multiplication, and division. 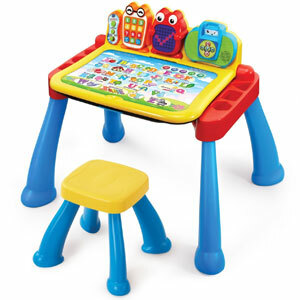 The Touch and Learn Activity Desk is an engaging learning desk for toddlers full of fun learning content. Explore 5 activity pages, learn letter and number strokes, build your vocabulary with over 100 words, and learn how to draw basic shapes. The learning desk even can convert into an easel for fun with art. Make pretend phone calls, listen to fun music, and engage in over 20 activities. It’s the perfect learning center for toddlers. My Pal Scout or Violet actually learns your child’s name and favorite things. 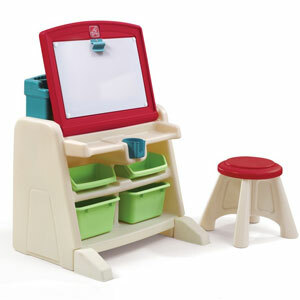 To program the toy, you can use a tablet, smart phone, or computer. When you turn him on, he will actually say your child’s name. Children can press his paws to activate the different activities. Scout loves to sing too. He’ll actually sing a song that spells your child’s name. This Little People Big Animal Zoo playset delivers interactive fun! 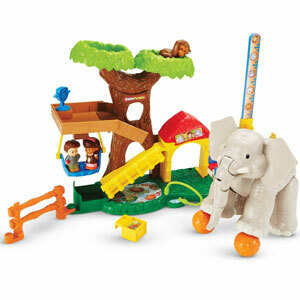 The set features an interactive elephant and monkey with music and silly sounds. Swing the monkey on the treetops. Use the tools to ensure the animals are healthy. Tilt the platform to send food into the feeding bin. Bring the fun and excitement of the zoo home. You will enjoy chasing your 2 year old outside with these toys that allows them to throw their whole body into it. Grab a pail and shovel, nothing is more fun than building a sand castle out of sand. Consider getting these gifts that will make playing outdoors even more fun. 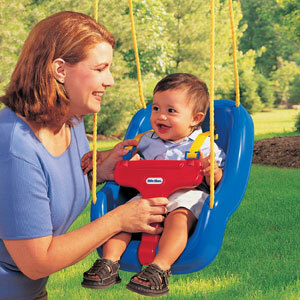 The Little Tikes Snug ‘n Secure Swing is a fantastic indoor or outdoor swing for toddlers. 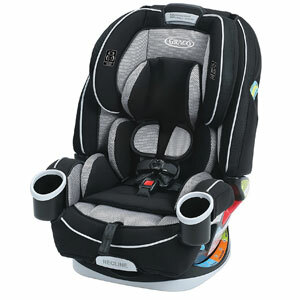 It features a hinged T-bar and shoulder straps to secure your 2 year old in place. It is proudly made in the USA and is available in two colors – blue and pink. The swing grows with your child, allowing you to remove the T-bar and straps. Every little kid needs their own picnic table. 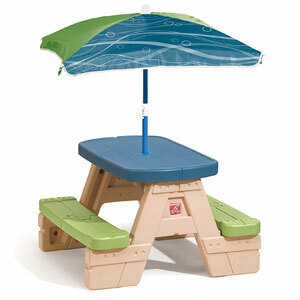 The Little Tike Easy Store Picnic Table is perfect for playing, coloring, art projects, and even eating. It has a shade so kids can have their dinner or lunch outside when it is beautiful outside. Unlike patio furniture, this folds flat so it easy to store. It seats up to 6 children and holds a maximum weight of 200 lbs. 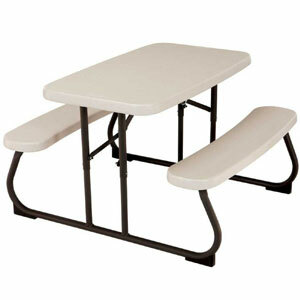 Give little people their own table with this picnic table from Lifetime. This picnic table holds up to 4 children. It can be used for lunch, crafts projects, or at the next family barbeque. The coolest part is that it folds flat for easy storage. 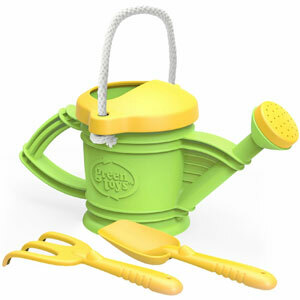 Your little gardener will adore this eco friendly watering can. With a great flow of water, it encourages kids to go outside and water the plants and flowers. It also comes with a rake and shovel built for adventures at the beach or mud. Best of all, it is built to last. 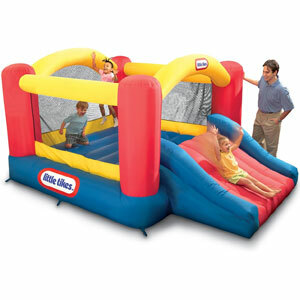 The Little Tikes Jump ‘n Slide Bouncer is super fun for little kids. It features bright, fun colors and limitless bouncing fun. There is even a fun slide that is a pure blast to ride. The bouncer measures 12′ x 9′ x 6’ and offers mesh protection. It’s a heavy-duty blower built with puncture-resistant material. Perfect for outdoor play. 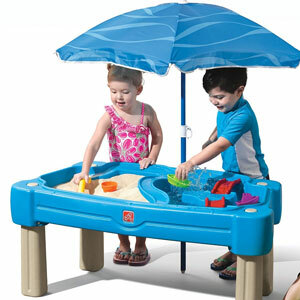 Turn your backyard into the beach with the Step2 Playful Sand Table. The sand table comes with 2 shovels, 2 claw rakes, and a bucket. We love the elevated sturdy table design which keeps the sand off the floor and out of your kid’s socks, shoes, and pants. 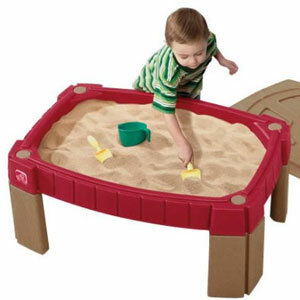 Your little ones can dig, rake, and build castles in the sand, creating their very own sand adventures. 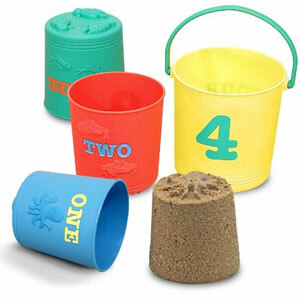 These pails from Melissa & Doug are incredibly durable. This set includes 4 pails. The best part is that they nest conveniently inside each other saving space. Each pail has a different molding on the top. Fill it with sand and turn it over to get a sand castle mold with a little starfish, turtle, crab, or octopus on top. 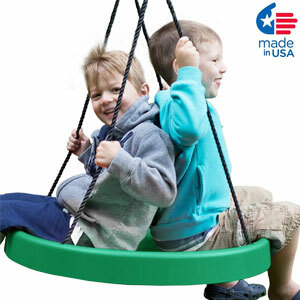 The Super Spinner Swing is a fantastic addition to your child’s swing set or tree. Installation is quick and easy with the included handing kit. It’s heavy-duty and supports riders up to 200 lbs. Up to two toddlers can ride together and it’s proudly made in the USA. Now this is classic fun! Turn the backyard or room into a playground with this slide from Step2. 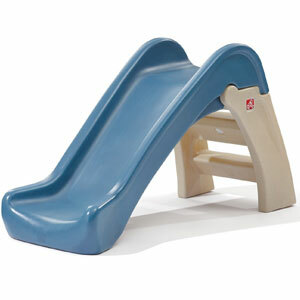 This compact slide offers tons of fun for little ones. Kids can climb up the stairs and slide down. The slide is all one piece and you simply slide the safety bracket to prop it up right. The slide folds back down compactly. This is every 2 year olds dream: Having their own park. Now you can bring all the fun of the playground to your backyard with Adventure Play set from Lifetime. There’s a 9 foot wavy slide, a swing area with 3 swings, and even monkey bars. It’s all built out of metal so there is no maintenance required. It’s well built, sturdy, colorful and whole lot of fun. 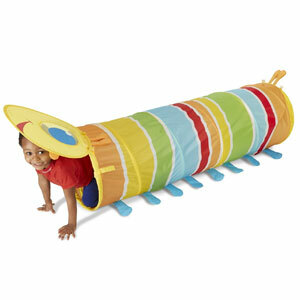 The Sunny Patch Giddy Buggy Crawl-Through Tunnel inspires fun-filled activity for your toddler. 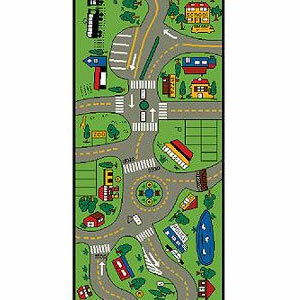 It’s nearly 5-feet long of fun and perfect for promoting gross motor skills and problem-solving. The crawl tunnel is made of durable materials and it is perfect for either indoor or outdoor fun. Active is the best word to describe a 2 year old. That’s why sports toys are one of the top toys for 2 year olds. Give your child balls to kick, hit, or throw with these sports toys. 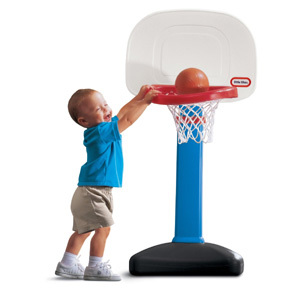 Adjusting from 2 to 4 feet, the Little Tikes EasyScore Basketball set grows with your child. It can be used both indoors and outdoors. The over sized rim makes it easy for even little ones to make shots so everyone is a winner. The small basketball is perfect for little hands to hold. For kids, it a slam dunk. 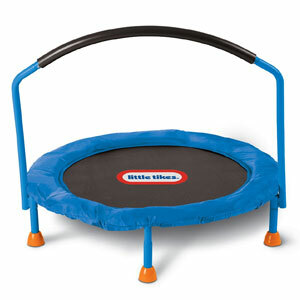 Toddlers who love getting active and jumping around will love this 3-foot trampoline from Little Tikes. Kids won’t even know it, but they’ll be burning a ton of calories and get physical fit while having a total blast! It features a large jumping surface to maximize the fun and pleasure. A handle bar offers stability and ensure the safety of your toddler. The trampoline is solidly constructed with plastic and metal. This trampoline is intended for indoor use only. 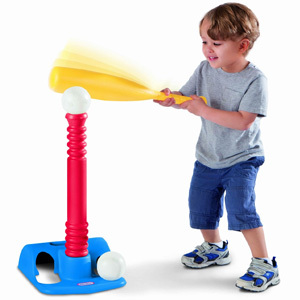 Little batters can swing for the fences with this outdoor t-ball set from Little Tikes that develops batting skills, motor skills, and eye hand coordination. With an adjustable height of about 1 inch, it can be adjusted for your child. The oversized bat and ball make it easier to hit the ball. The base of the T can be hung from the wall for easy storage. It’s a homerun. 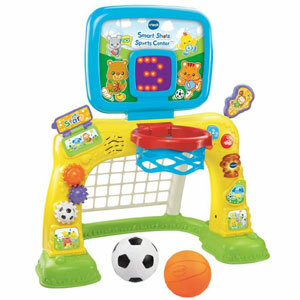 VTech scores with the Smart Shots Sports center. The toy gives even the youngest children the ability to play both basketball and soccer. It includes a soft basketball and baseball. The animated scoreboard cheers kids on. With over 50 sounds and phrases, this toy also allows kids to press buttons, turn switches, and flip pages to learn about shapes and numbers. What happens when you cross zoo animals with bowling? You get this colorful bowling set from Melissa & Doug. First time bowlers will enjoy this bowling set. 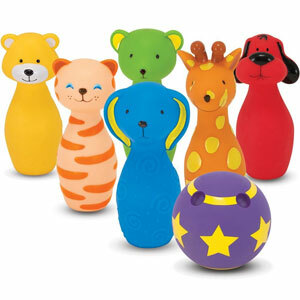 The animal bowling pins are so adorable. There’s bear, cat, mouse, giraffe, dog, and bunny. Kids will love making the pins go boom. And hey if you miss, you can just kick them down. With 2 fun colors, these fashionable skates are perfect for first time skaters. With 3 stages of growth, even the youngest skaters can learn to roller skate. You simply wear the skates with your shoes on and adjust the skates to fit your child’s shoe size (6 – 12). The best part is that your child can progress at her or his own pace. 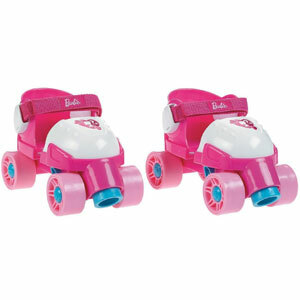 When you first start out, you can lock the wheels so that you can learn to balance with the roller skates on. Then you can make the wheels roll only forward before you go freestyle. 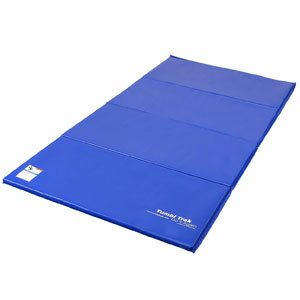 With Tumbl Trak’s Folding Gymnastics Mat, toddlers can get physically fit with a variety of activities. It’s perfect for gymnastics, exercise, cheerleading, yoga, martial arts, and more! The mat is 4′ x 8′ and offers the best quality and durability at a great Available in a variety of colors meet your style preferences and room’s decor. This is a nice colorful first soccer ball for a 2 year old. 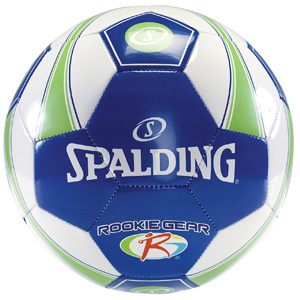 The Spalding Rookie Gear soccer ball lets even small kids have fun kicking. This ball is 15% lighter than traditional balls so kids can safely kick the ball with a lot more control. It is a great gift for the kids or grandkids. Now is the perfect time for your 2 year old to work on their balance and coordination. 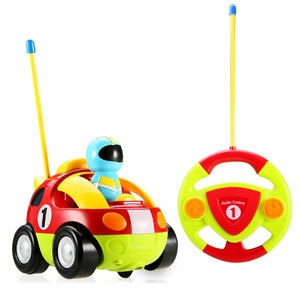 These gifts are designed to help kids master proper balance and steering. Who said 2 year olds can’t drive? Once they learn to go forward, stop, and turn, kids will love pretending to go places in their very own car. Let your 2 year old go on adventures of their own. Here are the best riding toys for 2 year olds. 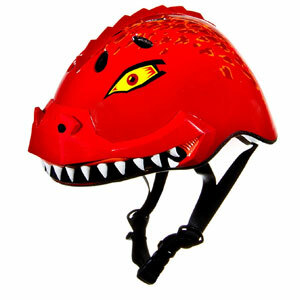 Rock your toddler’s world with this awesome dinosaur helmet from Raskullz! The helmet features shock-absorption and has passed all safety requirements to protect your child’s noggin while riding their ride-on vehicle. Cooling vents help to keep air flowing inside to keep your toddler dry. The helmet offers a great fit for toddlers and easily adjusts. Available in a variety of cool dinosaur designs. The 4-in-1 Stroll ‘n Trike offers four unique ways to ride and it grows with yoru child. 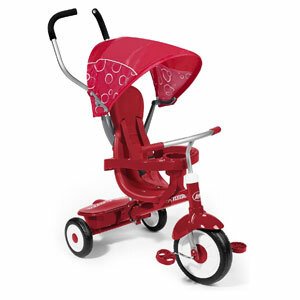 Ride as an infant trike, steering trike, learn-to-ride trike, or classic trike. Safety is clearly a high priority with a 3-point harness , high back seat, and wrap-around tray design. The seat is adjustable, allowing the trike to adapt as your child grows. In fact, the safety tray and canopy are removable. A handy storage bin is located in the rear. It’s the ultimate adaptable trike that will provide fun for years. 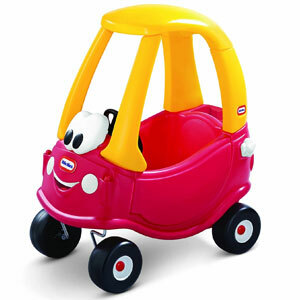 With his happy face, the classic Cozy Coupe is how kids get around. It comes with a removable floorboard for kid powered fun. The front wheels turn in every direction, allowing kids to turn easily. 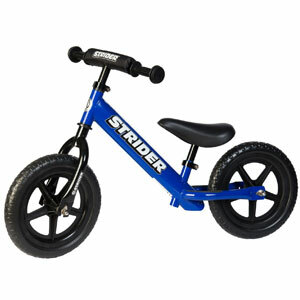 After they learn to walk, little kids can ride the Strider bike. The simplicity of the design let’s even the youngest rider ride. There are no training wheels or pedals to get in the way of learning how to balance, lean, and steer the bike on two wheels. Learn to ride a bike in stride. 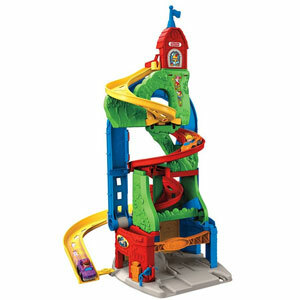 For young thrill seekers, this award winning 10 foot ride on toy turns the backyard or living room into an amusement park. Best of all, there are no height requirements. Push the coaster on the track up to the top of the track locking it place. Then climb up the steps onto the coaster and ride back down. Whee! Now if only there was an adult version. 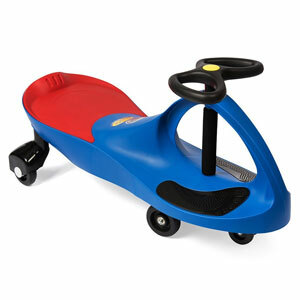 The PlasmaCar is an award-winning innovative ride-on toy. It’s built with high quality construction and they are safe for kids. The design is quite striking and it is kid-powered. There are no pedals or gears to deal with. It works best on smooth surfaces and all you need to do is steer in the direction you want to go. It’s a great way to get active while having a blast! 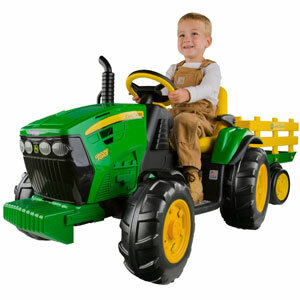 Hop onto the John Deere Ground Force Tractor with Trailer for amazing adventures on the farm. The tractor features 2.25 and 4.5 mph speeds forward as well as a reverse mode. The tractor features automatic brakes and travels on a variety of surfaces, including grass, dirt, gravel and pavement. A working FM radio allows toddlers to jam to tunes while out on farming adventures. All aboard! 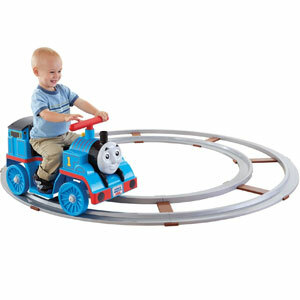 Little Thomas fans can speed around the 15 foot track just like Thomas at 1mph. Off the track, Thomas chugs along at 2mph. Kids steer Thomas with the steering bar while pressing the simple push button to move forward. With authentic Thomas sounds, it’s like being in Disneyland. Gear up for thrills with a realistic ATV riding experience. The sporty ATV styling looks realistic and sleek, making for a more realistic play experience. 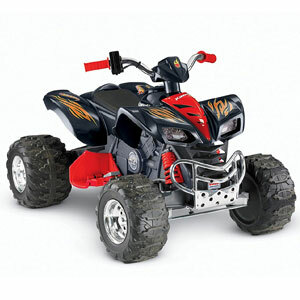 The ATV reaches exhilarating speeds of 2.5 – 5 mph. Twist the grip throttle to kick it into high gear. Battery and charger are included with the package. Choose from a variety of different styles. This wagon is like a limo for kids. 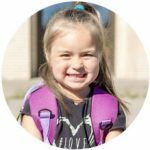 Thanks to the 5 way flippable seats there are many seating arrangements that are possible whether you have 1 child, 2 children, or want to transport something. For added safety, 2 seatbelts are included. Kids will love sitting back and relaxing on the padded seats while the canopy protects them from harmful UV rays. You can even bring along snacks and drinks with the expandable storage compartment and cup holders. What adventure do you want to go on? 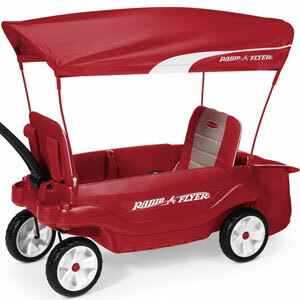 The Radio Flyer 2-in-1 Journey wagon is 2 wagons in 1. 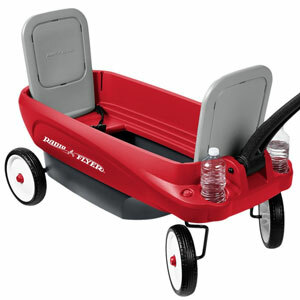 Get ready for double the fun with this wagon that is ideal for families with either 1 or 2 kids. The seats flip down, allowing you to transform the wagon into a flatbed that can be used for transporting stuff around. Don’t forget to bring along snacks and drinks as this wagon has 4 cup holders. 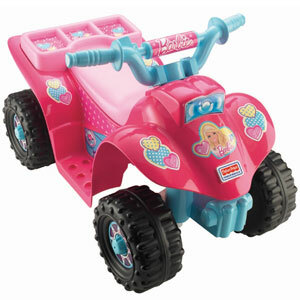 This pink inspired Barbie vehicle from Power Wheels looks as glamorous as Barbie. 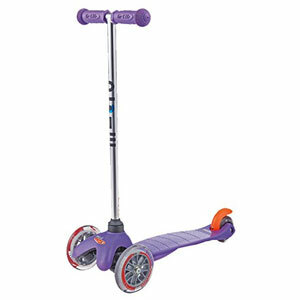 Designed for kids up to 40lbs, it comes with a battery for charging it. Tots will enjoy speeding along at 2mph with the press of the button without having to worry about reversing. Even Barbie’s boyfriend, Ken, would be jealous of your little princess. 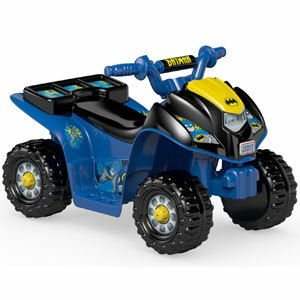 Designed for kids up to 40 lbs, little Batman fans will love flying around on this Batman themed quad at 2mph on hard surfaces or grass. Though it doesn’t reverse, this quad moves forward with the press of a button. The steering wheel turns left and right and the built in footrests make it a comfortable ride. Now even little kids can save Gotham by chasing the Joker around in their own Batmobile. Your child will look so adorable riding on top of these oversized animals that look straight out of an amusement park ride. The wheely bug comes in a variety of different animals from a big eared mouse to an adorable bee. Kids hold the bar and spin around, move sideways, forwards, and back, wheeling around the house. Meet the Pony Cycle from Smart Gear. 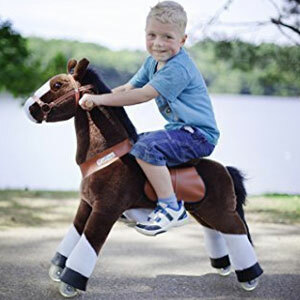 This is the world’s first simulated riding toy for kids. Kids will feel like they are galloping on a real horse. The horse can even steer left and right. It’s a thrilling ride that you have to experience to believe! Where will their pony adventures take them? Your toddler is simply going to love this! 2 year olds love imitating mommy and daddy. Baby dolls are not just one of the best toys for 2 year old girls, they are also one of the best toys for 2 year old boys. Dolls encourage little ones to develop nurturing skills through pretend play. Learning to care for a doll can also help kids prepare for a little brother or sister. From castles to homes, these dolls & doll houses and play sets are sure to stir up your 2 year old’s imagination. La Baby Doll by JC Toys is an 11-inch soft body realistic looking doll designed by Berenguer. The doll features realistic head, arms, and legs that will create for a more realistic baby playing experience. 2 year olds will love holding and nurturing this real-life baby. The baby doll is even available in different ethnicities. Perfect for nurturing and caring play and developing social skills. Just like real life, there is so much of activity happening in the Little People Happy Sounds Home. Open up this home to create your own fun stories with the 3 included Little People. There’s mom, dad, and baby. With two floors of fun, each room has so many things to explore. Just by opening and closing doors or pushing buttons, fun sound effects and music is played. Your child might just want to move in with the Little People. It’s time to eat! Your 2 year old’s Mine to Love doll will need to eat at some point. 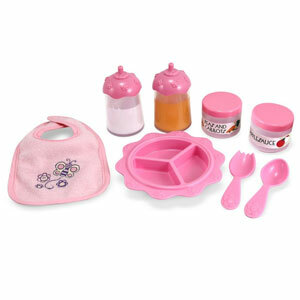 This feeding set includes 8-pieces to enhance playtime. Keep baby clean with a lovely butterfly themed bib. Other feeding accessories include an orange juice bottle, milk bottle, applesauce, peas and carrots, partitioned dish, fork and spoon. What’s neat? The orange juice and milk disappear from the bottles as you feed baby. Great nurturing and caring, and feeding accessory set for fantastic doll play. 2 year olds will love playing with Mine to Love Jenna. She is a baby doll with sweet rosy cheekys and beautiful blue eyes. She loves sucking her thumb. Her soft, cuddly body will encourage hours of imaginative play. Here eyes open and close like a real baby. The baby is made with exceptional quality and it will promote nourishing play and build a sense of empathy. This Mine to Love Doll accessory set is the perfect assessory for your doll. It’s a doll diaper changing set complete with a diaper changing bag, baby wipes, cloth diaper, and rash ointment. The set makes it easy for your 2-year-old to organize all of their baby supplies. Perfect for pretend play fun! Boldly go on superhero adventures with Superhero Will Wonder Crew Buddy! 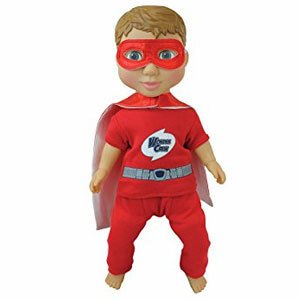 This superhero action doll is the perfect buddy for your 2-year-old to inspire creative imaginative play. It’s adventure through friendship. What’s cool? A matching cape and mask are also included so your child can tag-team with Superhero Will on incredible adventures to save the universe! You can’t go wrong with giving Baby Stella Peach as a gift. 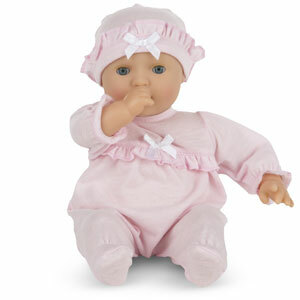 The latest version of this award-winning baby doll is now cuddled up in her cute pink pajama outfit. By her side, she’s got her pacifier. Your little one will love squeezing her. Ah, sweet dreams baby. 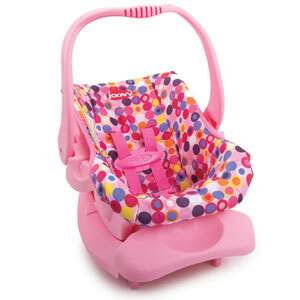 Available in pink and blue-themed designs, the Doll Toy Car Seat is the perfect accessory for your 2-year-old’s baby doll. It’s the perfect way to transport baby around town and take them on exciting adventures. The car seat fits 12″-20″ dolls or stuffed animals and features a 5-point harness system to restrain your child’s baby doll. An ergonomically designed handle is perfect for little hands to grasp. The best part is that the carrier doubles as a rocker when removed from the base. My First Dollhouse from Fisher Price is the perfect introduction to the world of dollhouses. 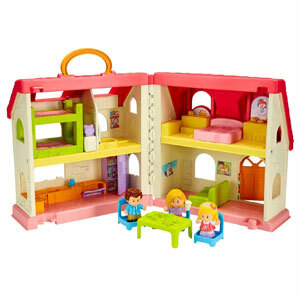 The dollhouse features a bright, colorful design that will appeal to 2 year olds. There are loads of fun play features to keep toddlers entertained for hours. Five rooms and 3-stories of fun allow for plenty of creative play. Set also includes a family – mom, dad, and baby figures to imitate real life. Watch as your toddler’s imagination soars to new heights with nurturing and creative role play! Children will be delighted to take care of this adorable 12 inch doll from Corolle. Her pink pajamas and nightcap are so adorable. The doll’s arms, legs, and head are made of plastic, but the soft body is bean bag filled. She is just the right size for 2 year olds and smells so wonderful. You can even put her to sleep. 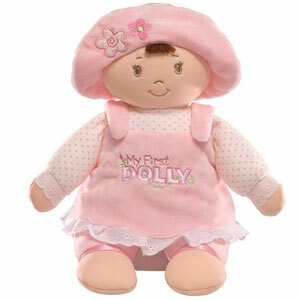 My First Dolly Stuffed Doll from Gund is the perfect first doll for 2 year olds. She looks so cute in her embroidered pink dress and floppy hat with flower embroidering. Details like and embroidered nose and eyes ensure the safety of your child. An excellent first doll and perfect for nurturing and creative pretend play. Available in blonde or brunette versions. Honey I shrunk the stroller. This child size doll stroller is adorable and comes fully assembled. 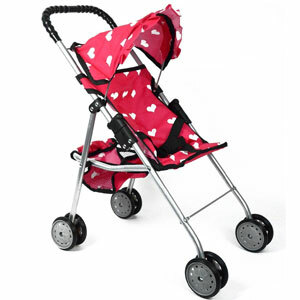 Everything from the cute heart design to the canopy to the basket below makes the stroller authentic. It’s a perfect companion for pretend play. Little ones will love putting their dolls and stuffed animals in and pushing them all around the house. Children love gifts that look just like them and that is why this baby boy doll from Corolle with be a big hit with boys. The skin is gorgeous vinyl and the light vanilla smell gives it a realistic baby smell. His soft beanbag body is perfect for hugging. It gives children the responsibility for caring for a young baby. 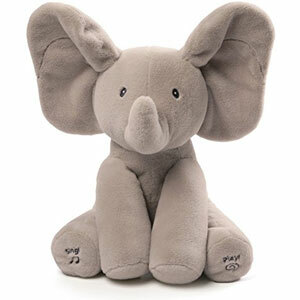 Soft and cuddly, these plush toys make great gifts for 2 year olds. This adorable little elephant beek-a-boo with your child, pulling its ears over its face. Simply press his foot to make him come alive. It will bring a smile to any little one’s face. Soft and cuddly, kids won’t be able to let go of it from the day they get it. Again, Again. 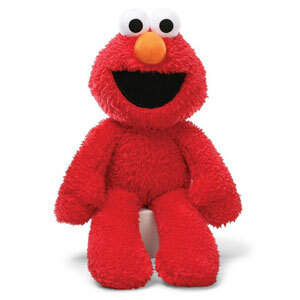 Gund’s plush Elmo looks cheerful and adorable. He’s a 12-inch plush buddy that 2 year olds will want to take on fantastic adventures. Elmo is full of fun and features high quality materials. Kids will love squeezing and hugging this plush-perfect replica of Elmo from Sesame Street. Almost everybody has a sweet tooth. 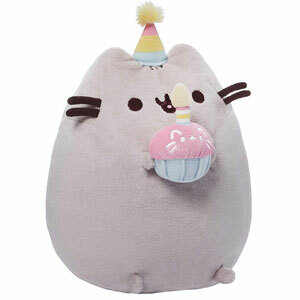 Gund Pusheen Plush surely has a sweet tooth for … mmm yummy chocolate chip cookies. This plush figure stands 9.5-inches tall and features an animated hangtag and moving tail and whiskers that bring it to life. 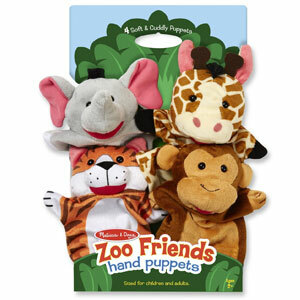 With four soft plush palace pal hand puppets, your two year old will be inspired with creative, imaginative play. The set of four puppets includes a prince, princess, knight and dragon. They are soft and cuddly and fantastic for developing eye-hand coordination, motor skills, and communication skills. Look who it is? 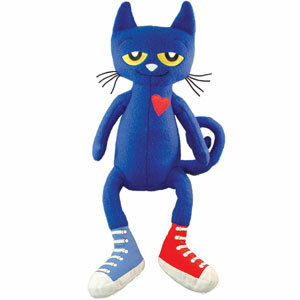 It’s Pete the Cat from the book. He’s even more adorable in person with his big feet and multicolored red and blue shoes. 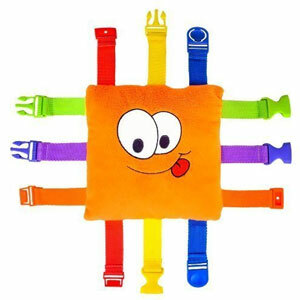 The Buckle Toy Bizzy is a fantastic travel activity toy for toddlers. 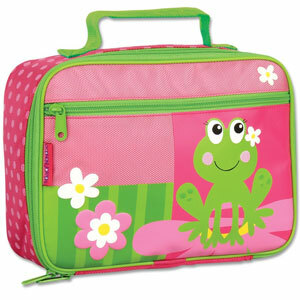 With fun vibrant colors, peek-a-boo flaps, and an array of six buckles with various clasp styles, it is sure to engage children and teach them important basic life skills. It’s also great for developing fine motor skills, eye-hand coordination, cognitive skills, and problem-solving. 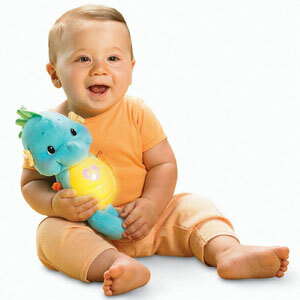 The Soothe & Glow Seahorse is a soft, cuddly, soothing, and comforting plush pal. With a squeeze, it plays 5 minutes of music, 8 lullabies, and soothing ocean sounds. It’s perfect as a bedtime pal, serving as a nightlight with a comforting glow. Which kid doesn’t love playing with superheroes? 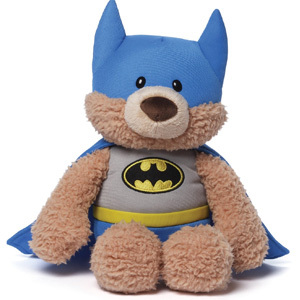 Toddlers will have fun playing with Malone, the lovely 12-inch stuffed bear, dressed as Batman. It’s an officially licensed DC Comics toy featuring the Batman logo embroidered on Malone’s chest. He comes complete with the bat suit and cape for incredible superhero adventures in Gotham City. Ah, look at his face. Boo is the world’s cutest dog. 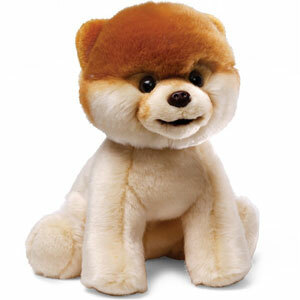 Now Gund has been able to make a Boo plush toy that is just as cute. This life size plush is made of a soft warm huggable material. He’s just irrestible. This large 17-inch Slumbers Teddy Bear Stuffed Animal was crafted with love and care from Gund. He’s crafted with Gund’s famous high quality. Toddlers will love taking this lovable teddy bear on wonderful adventures. 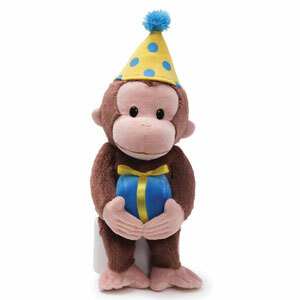 It’s Curious George’s birthday and he’s all dressed up for the special occasion with a fun birthday hat and gift in hand. 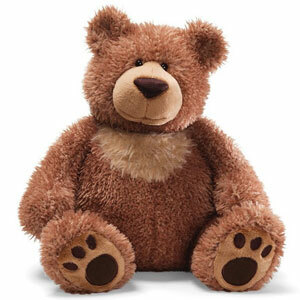 He’s so soft and cuddly, made from Gund’s famous quality and he stands 14″ tall. It’s sure to inspire some fun birthday adventures. 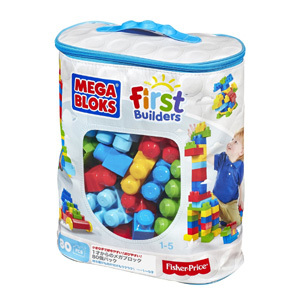 This pack of large 80 colorful Mega Bloks comes in two colors schemes classic and pink. This is a great introductory set that teaches colors, stacking, building, counting, and spatial skills. It’s fun on its own but can be combined with other First builder sets for more fun. 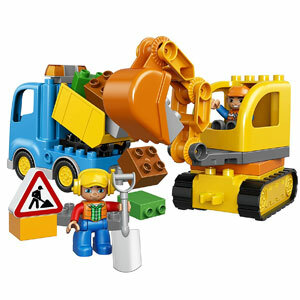 Gear up for an excavation mission with the LEGO DUPLO Town Truck & Tracked Excavator set. This set features 26 pieces and builds a truck and tracked excavator. The truck features a cool tipping feature for dumping action. The tracked excavator features moving tracks, rotating cabin and shovel on a posable arm, plus two DUPLO figures, inspiring fascinating creative role play. Great set for developing early building skills and promoting fun role play. 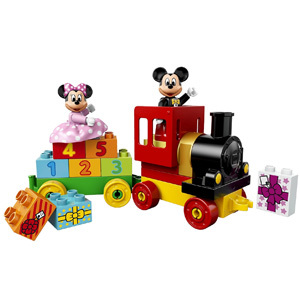 Celebrate with Mickey and Minnie with this Birthday Parade building set for toddlers and preschoolers. The large Duplo pieces are perfect for toddlers to handle. The set features an easy build with 24 pieces. The set builds a fun train with a birthday cake, large birthday candle, balloons, and gifts. Kids will be inspired to have a fantastic birthday celebration with Mickey and Minnie. 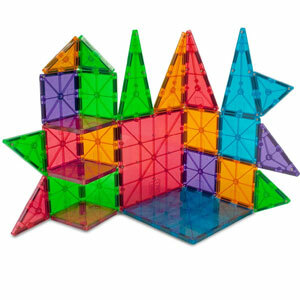 The Magna-Tiles are the original award-winning 3D magnetic building toy. 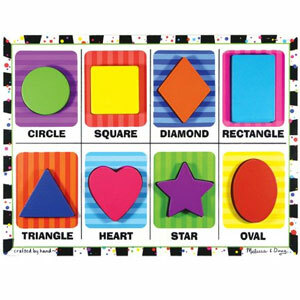 Magna-Tiles have earned an award for this toy for educational excellence. This fantastic and colorful set featurrs 100 clear colored tiles of different shapes and sizes. Build a rocket, building, structure or whatever you can imagine. There’s unlimited creative potential with Magna-Tiles. Discover the building toy where math, science, and creativity meet. 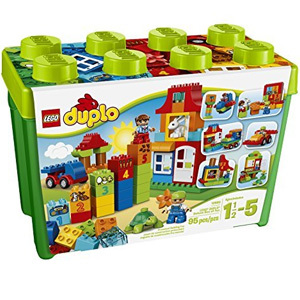 Offered in 2 colors, the 65 piece Lego Duplo box is great for introducing little ones to the world of Legos. The Lego Duplo blocks are twice the size of traditional Legos, making them perfect for small hands. In this set, there is a good selection of brick sizes and shapes to promote fun imaginative building play. 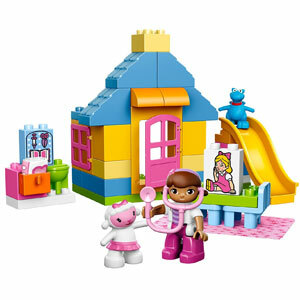 If your 2 year old girl is a big fan of Minnie Mouse, she will love this Lego Duplo set. 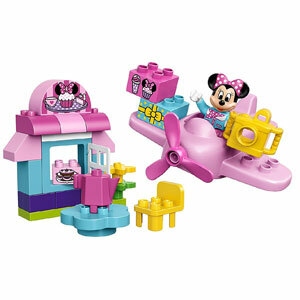 Not only will she love building the little Cafe but she will also love flying Minnie around in the Lego plane. It comes with 24 chunky sized Lego Duplo pieces that a perfect for young children just learning how to build. Learn and immerse yourself in farm life with LEGO DUPLO My First Farm. 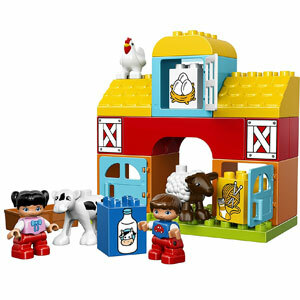 This 26-piece set offers a simple build for toddlers and it builds a colorful farm complete with a cow, chicken, two kids, and bricks with milk, eggs, and yarn to inspire fantastic adventures on the farm. This is an excellent gift for kids who love vehicles but want to get started with building Legos. With 36 pieces designed for young builders, kids can combine just a few colorful blocks to create their own easy to make vehicles. It is sure to fuel your child’s imagination. Every town needs to have fire fighters. This LEGO DUPLO Town Fire Truck can race to the rescue for fire fighting and rescue adventures. 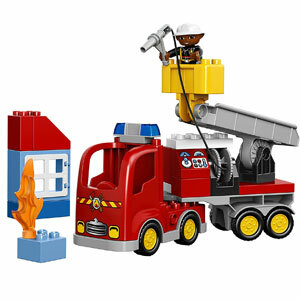 The fire engine features a moving and rotating crane for added play value. The set offers an easy build for toddlers with about 26 pieces. The pieces are fun and easy to handle for little hands. Perfect set for early building skills and inspiring exciting role play adventures. 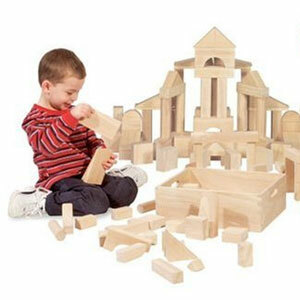 This high quality 60-piece wooden building block set from Melissa & Doug delivers classic building fun for toddlers. The pieces are smooth sanded for your child’s safety and hours of fun. The set comes packaged in a handy wooden storage tray. A variety of shapes are featured in this set, allowing for unlimited creative freedom in building. It’s an essential toy for any toddler’s collection. 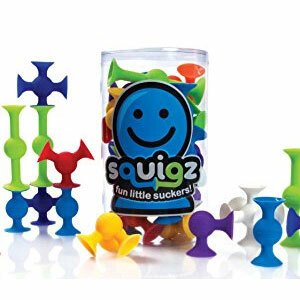 Squigz are fun little building toys. This starter kit contains 24 pieces fro building fun. They inspire creativity and experimentation and are made from high quality silicon rubber. When you take ’em apart they make a cool ‘pop’ sound. They are safe for your toddler free of BPA and latex. Play with them everywhere, even in the battub. These fun little suckers are great for developing early building skills, fine motor skills, and creativity. 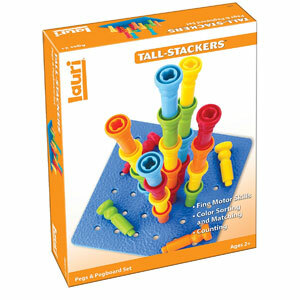 This set of 25 colorful tall-stacker pegs delivers big building fun for toddlers. The pegs are perfectly designed for little hands. Kids will build fine motor skills and learn color sorting, matching, and counting. Playing is simple. Simply place pegs in the 25-hole pegboard and build up and out. Great fun for early builders. Batman is one of the most beloved superheroes of all-time. Toddlers can build and play with their own Batman-themed DUPLO set. Gear up for high-flying adventures in Gotham City with Batman’s Batwing featuring shooting cannons. 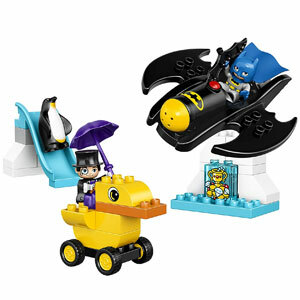 The set also features The Penguin in a colorful duck vehicle. Will Batman be able to put a stop to The Penguin’s antics once and for all? Toddlers love stacking and sorting at this age. 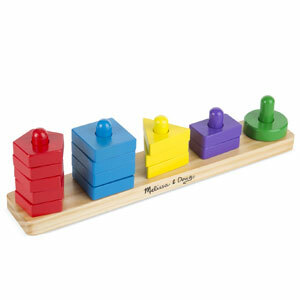 This 15-piece wooden educational toy helps toddlers build sorting and stacking skills. Sort by fun colors and shapes. Great educational set for developing eye-hand coordination, and sorting and stacking skills. 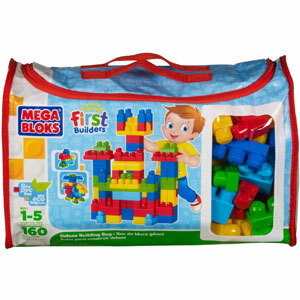 The Big Waffle Block Set delivers big fun with colored waffle-like building blocks. The pieces fit together well and toddlers have the freedom to build in any direction. Experimentation and creativity will allow your toddler to maximize the fun. The large waffle pieces are easy for toddlers to handle and build with and the toy is perfect for both indoor or outdoor use. Does she spend most her time watching Doc McStuffins and playing with Legos? Then she will love this 39 piece Lego set. It comes with minifigures of Doc McStuffins, Lambie, and Stuffy. Your 2 year old can give Stuffy a check up in the clinic. When his booboos are gone, they can all play outside on the Lego slide, seesaw, and picnic table. 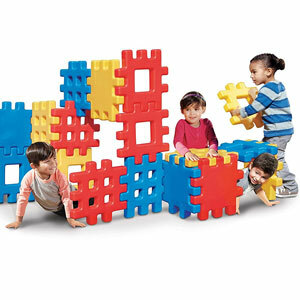 This jumbo assortment of 150 colorful Megabloks will keep your child engaged in creative play. With so many blocks, there is an endless amount of building possibilities that is only as big as your child’s imagination. Make houses, castles, cars, or whatever you dream up. This set can be combined with other sets from the First Builders line. 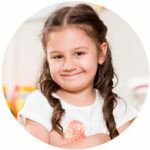 Even 2 year olds can be a part of family game night with these fun gifts that will help them develop their social skills. Here are the best rated board games. 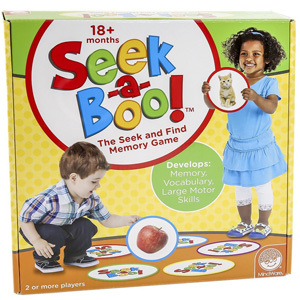 Seek-a-Boo from MindWare is a game of memory that’s great fun for toddlers. The toy develops your child’s memory, vocabulary, matching, and gross motor skills. With multiple ways to play, this game offers endless fun and learning! First Orchard is a great first game for toddlers. This classic game was created in Germany and has been around for 30 years, standing the test of time. It stimulates free play, color and shape recognition, and understanding of rules. 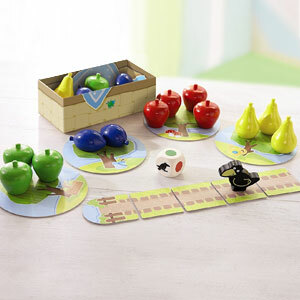 It is a simplified version of Orchard for younger players. Typical games last about 10 minutes and the game can be played by 1-4 players. 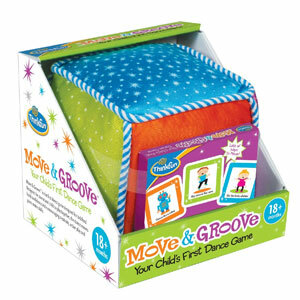 The Move & Groove Game is your child’s first dancing game. 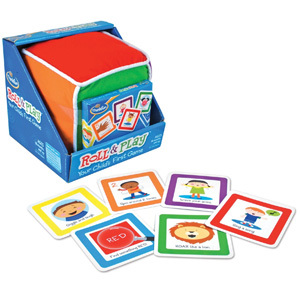 The game is inspired by the award-winning Roll & Play game and is perfect for toddlers. The game encourages kids to dance in different ways, such as ‘Dance like a robot’, ‘Do the funky chicken’, or ‘Skip around the room’. It’s a fun experience that will keep your toddler active while allowing the family to bond and play together. Challenge your 2 year old with a puzzle. The chunky puzzle is the perfect puzzle for a 2 year old. It’s the next step up from a jumbo knob puzzle. The pieces are great for pretend play, but as a puzzle the chunky pieces are easy for 2 year olds to hold. Along the way, kids will learn shapes and colors. After your child has mastered the chunky puzzle, they are ready for the smaller pegged puzzle. Here are the top rated toys in the puzzle category. Why get an ordinary puzzle when you can have a personalized fun and educational puzzle? This wooden personalized and customized puzzle features your toddler’s name in a high quality wooden puzzle with primary or pastel colors. The wooden puzzle pieces have been tested to be safe for kids. The puzzle may contain a maximum of nine characters and they are proudly hand-crafted in the USA. Toddlers will have fun learning shapes, colors, letters. 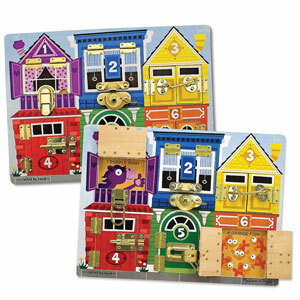 This fun, colorful, and creative set from Melissa & Doug introduces six different latches to children in a fun activity board. Fun surprises await toddlers behind each locked door. Kids will have to hook, snap, click, or slide to unlock the puzzle. Kids will discover colors, numbers, animals and more! Fun and creative set for developing dexterity and fine and gross motor skills. This chunky puzzle is perfect for 2 year olds. Kids will love not only learning to place the safari animals into the puzzle, but playing with the animal pieces on their own. The animal shapes are great for pretend play. Kids will love making their own stories with the animals, learning their names, and matching the shapes of the puzzle. 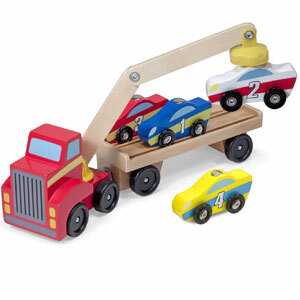 The smaller pegs on this vehicle puzzle are great for building fine motor coordination. 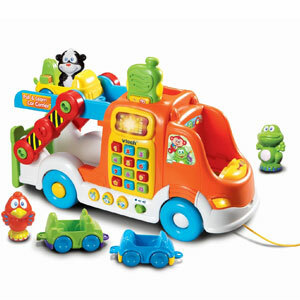 With 8 vehicles, it is bright and colorful, designed to attract the interest of your little one. Kids will love learning all the vehicle names. The pieces can also be used as story props. 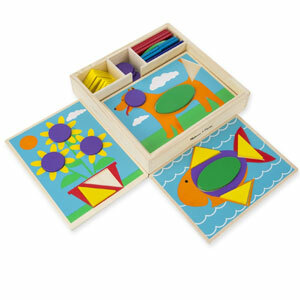 This chunky puzzle from Melissa and Doug is great for learning not only basic shapes but also colors. With their thick shape, the pieces are easy to grab and carry around. There’s more to this toy than just completing the puzzle since the pieces are able to stand up. You can ask kids to identify the green circle or even stack the shapes on top of each other. My First Match It sets are perfect for toddlers. They are an excellent first puzzle set for kids. Sets include about 15 self-correcting puzzle pieces that make learning fun and enjoyable for toddlers with fun pictures. 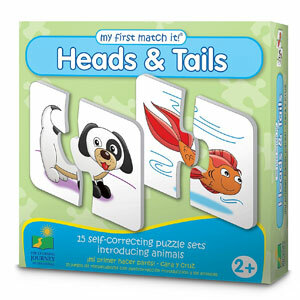 In Heads & Tails, kids will have to match the head and tail of each animal to complete the image. Kids will love the colorful illustrations on the completed puzzles. 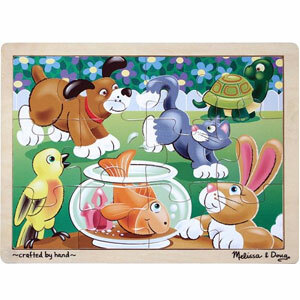 The Pets Wooden Jigsaw Puzzle from Melissa & Doug is a wonderful first jigsaw puzzle for little ones. It features sturdy wooden construction that is built to last. The set contains 12 pieces and the completed puzzle creates a fun and charming illuustration full of cute animals that will appeal to children. A handy wooden storage tray is also included. Featuring five double-sided boards, 10 recessed designs, and 30 geometric shapes, the Beginner Wooden Pattern Blocks Educational Toy is the perfect first puzzle for little ones. It’s full of fun colors and images to complete. The early development toy comes packaged in a handy wooden storage box. Kids will have fun learning about colors, shapes, and problem-solving. 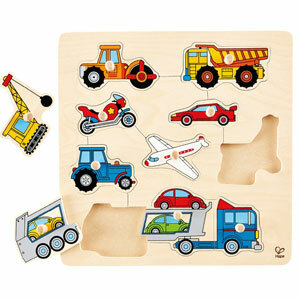 With 11 pieces, this hardwood vehicle puzzle is the perfect first jigsaw puzzle for 2 year olds. It’s perfect for little ones that love cars, trucks, and things that go. It’s got more than your typical amount of vehicles than your standard vehicle puzzle. The small pegs help children put the pieces in place. The best part of puzzle is actually the bottom truck. You actually have to put the pieces in the correct order before the truck is built much like a real jigsaw puzzle. It is a great step before advancing to more advanced puzzles. Treasure those early scribbles. Put them on the refrigerator or hang them proudly on the wall. When choosing art supplies for 2 year olds, look for special options that are non-toxic, washable, and won’t stain clothes, furniture, walls, or skin. 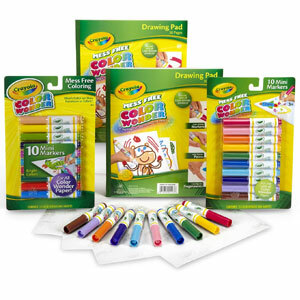 Give your little artist the tools to express their creativity with these great gifts. These reusable activity books are great for at-home or on-the-go fun for toddlers. An included water pen reveals the color. When it dries up, the color disappears so toddlers can have endless coloring fun! Interesting age-appropriate themes include animals, alphabets, and numbers. The water pen is easy for little ones to grip. An entertaining activity for children without the mess! 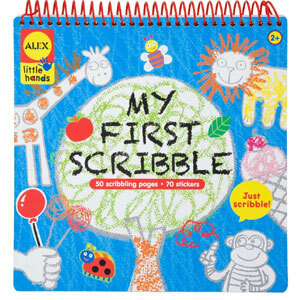 Capture your little one’s first scribbles all in this scribbling pad. Inside the pad, there are fun scribbling activities that are designed to get your child well , scribbling. The back of each page is blank so your child can use their imagination to create anything. The pages are nice and thick. There are even stickers to add additional flare. Here’s a fun art project that offers hours of fun, while helping your little one develop fine motor skills and creative thinking. Tots just have to snap and match the colored buttons into the pictures to create adorable button art. There 10 different pictures and the activity can be done over and over. 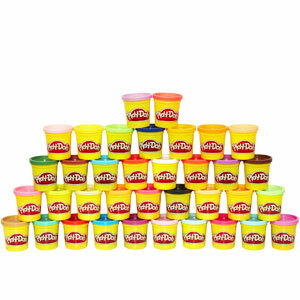 36 cans of Play Doh goodness. This is 2 year old Play Doh heaven. Kids will love making pretend foods, flowers, and whatever they dream up. With a wide variety of colors, kids will never be bored. Honeystickers will be your toddler’s favortie crayons. They are easy to grip, kid-safe, and deliver a world of color and fun! 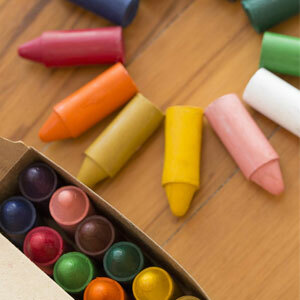 They don’t break easily like regular crayons offering long-lasting fun and did we mention they smell fantastic! A great way for your child to express their creativity. Are you worried about your kids coloring on the walls? With Crayola Wonder Markers, you don’t have to worry about your kids getting their masterpieces on their clothes, skin, the carpet, or the walls. 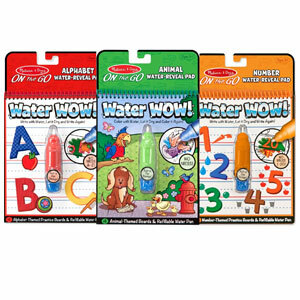 These specially designed markers are clear and the color only magically appears on the special color wonder paper. It’s like magic. This set includes 20 markers and 2 drawing pads. 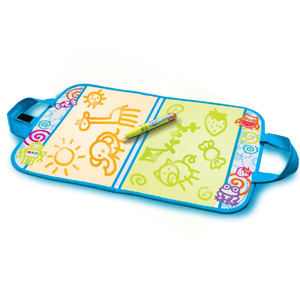 Take the fun of Aquadoodle on the go with you with Aquadoodle Travel Doodle Neon. Doodle again and again! The fun never stops. Simply add water and watch as your kids creativity is unleashed. Great gift for inspiring creativity! These washable finger paints from Alex Toys come packaged in a cute tin that looks like a paint can, making it an excellent gift. 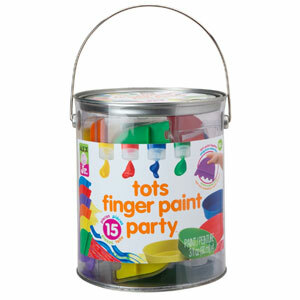 Inside the can, you get almost everything you need for your tot’s first finger painting experience. There’s even a cute apron. There are 4 bright colors: red, blue, green, and yellow. Painting is done using the included tools which create fun effects or by using your hands. Sidewalks are boring. 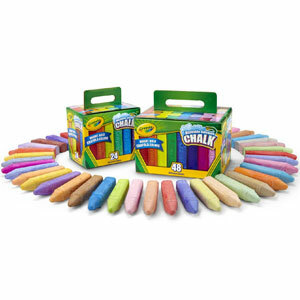 Add a little life to them with 72 pieces of sidewalk chalk! There are so many different bold colors. Children will love coloring the chalk on the sidewalk and driveway. Each piece of chalk is squared shaped to keep it from rolling around. Best of all, the chalk is designed to wash away with water so you can create a new masterpiece every day. The Eat & Play Smock is perfect for mealtime, arts & crafts, and more. It’s made of breathable materials and protects against spots and spills with full coverage for the front and back. Elastic sleeves ensure a comfortable fit. The fabric can be easily wiped and is machine-washable. Playtime or mealtime won’t spoil your good clothing now. This is like a little art station for your little Michelangelo. The coolest part? It transforms. The easel flips down to form a desk with a fun stool to sit on. The magnetic dry erase board is perfect for 2 year olds. No mess! With several trays and bins, there is tons of storage for art supplies. 2 year olds love music and the chance to create their own sound no matter how noisy. Give your child these gifts and expect to hear many original compositions. The KidiBeats is a rocking drum set for kids. The set features three drum pads and a cymbal for outstanding entertainment. 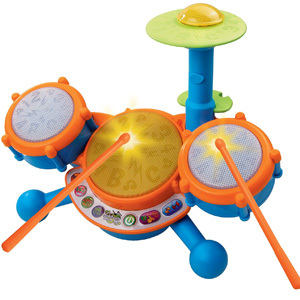 The drum set allows toddlers to play 9 different melodies in rock, pop, and dance styles. The music toy teaches music, letters, and numbers. Your toddler will feel like a real rock star! Do your kids love banging on things or playing pretend drums? 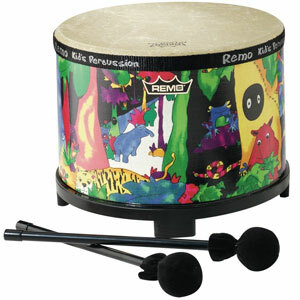 Then this drum from Remo is the perfect gift. Even little kids will love banging on this 10 inch drum with either their hands or the included 2 mallets. This is actually a real drum that is built especially for kids. Unlike most toy drums, it sounds great when hit. The entire family will want to join the band with this band in a box from Hohner kids. Made in Israel, this is a great instrument set. 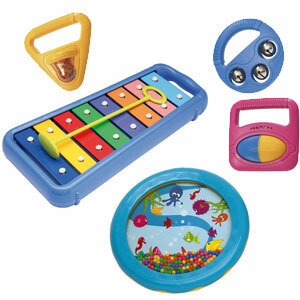 It includes a xylophone, wave drum, rattle roller, and other fun instruments. Compared to other musical sets for kids, this one actually sounds great instead of just random noise. 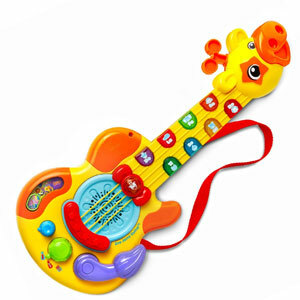 Toddlers will be jammin’ with the Zoo Jamz Guitar. It’s a bright, colorful, and cheerful design that will entertain your little musician. The guitar is designed as a cute giraffe and you can play funny animal sounds to eight popular tunes. Add cool guitar effects with the whammy bar shaped as a giraffe’s tail. Kids even have the freedom to create their own music with this fun music toy! Kids will be encouraged to learn to play the piano and more with this fun Zoo Jamz Piano set from Vtech. Play 4 different instruments from a piano and xylophone to a violin and saxophone. The light-up keys make it easy for your child to play along. This fantastic music toy allows you to create, play, and sing along for great fun! The music set features more than 100 songs, melodies, sounds and phrases to create an entertaining experience. A book is a great gift for just about anyone, but for 2 year olds, look for more advanced books with more than just a few words on the page. Look for books that invite kids to get into the story, matching the text with the pictures. For building comprehension, ask the child to point to the pictures and guess what happens next. Here are some great books that your 2 year old will beg you to read. Hallmark Personalized Books allows parents to custom-create a book where your child is the main character in the story. It makes it more personal and engaging for your 2 year old. 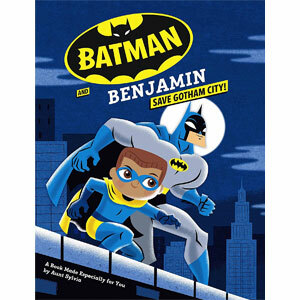 Stories range from superheroes and princesses to adventures and holiday-themed stories. 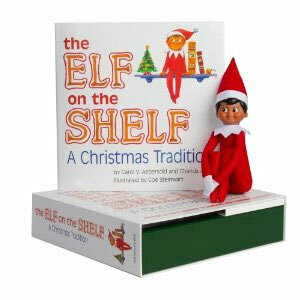 Make bedtime reading more fun with these excellent personalized books from Hallmark. 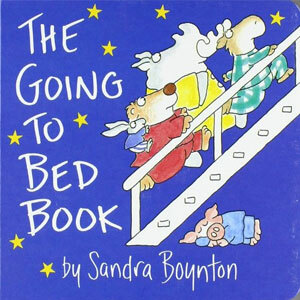 The Going To Bed Book is a classic bedtime story in board book form. Toddlers will be entertained by silly animals that scrub in the tub, bruh their teeth, and rock to sleep. This anniversary edition features a special enlarged trim size and metallic ink on the cover. It’s the perfect story to end your child’s day. 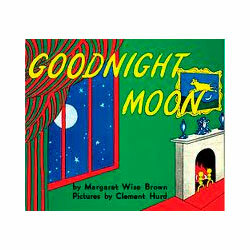 Goodnight Moon is a beloved classic bedtime story starring a bunny tucked in bed. He has a fascination with wishing everything in the room and even the moon outside the window a goodnight. Toddlers will love the beautiful poetry and wonderful illustrations in this board book. 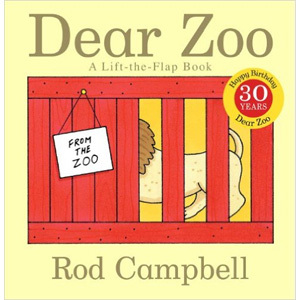 Dear Zoo is celebrating 30 years of fun and this classic children’s book is still as popular as ever! The storybook chronicles the adventures of a young kid in seach of the perfect pet. It’s a storybook sure to delight young readers. Where is Baby’s Belly Button? has kids lifting the flap for interactive fun! Kids will learn where baby’s eyes, hands, and more are located with this innovative design. Adorable babies play a game of peek-a-boo in this book that is sure to delight children. It’s the perfect children’s book for parents to share with your loved one. 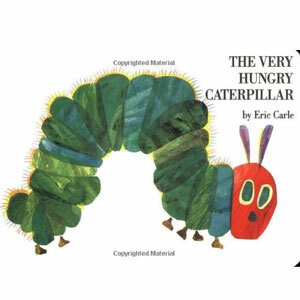 The Very Hungry Caterpillar is a classic book that is eye catching an intriguing to young ones. It’s the simple story of a caterpillar who eats through various foods until he gets an upset stomach. Kids will love the colorful pictures of food with little holes in them. As they flip through the book, they will enjoy poking their fingers through the holes as they learn how to count. Paw Patrol fans who can’t get enough of the show will enjoy this book based on the show. With cute illustrations from the show, it brings her favorite pups to life in book form. It is the perfect length for a bedtime story. 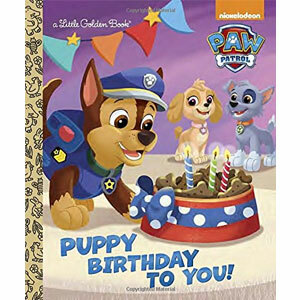 The birthday storyline makes it the perfect birthday gift for Paw Patrol fans. 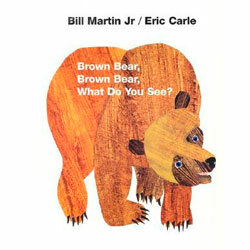 Brwon Bear, Brown Bear, What Do You See? is a wonderful children’s book featuring a host of fun animals from horses, ducks, cats, and frogs. The rising and falling text in tandem with the bold collages create an unforgettable experience of these animals. This is a great book for introducing little ones to the idea of potty training with the story being told from their point of view. With colorful colors, a loveable character, and humor, little ones are encouraged to go potty. It actually shows the child the hardest thing to do . . . sit on the potty and wait. What a fun way to teach little ones the basics. Tinkle, Tinkle, Toot. I did it. 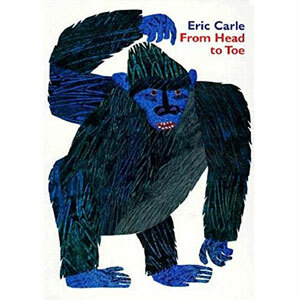 From Head to Toe is a fun-filled and interactive story that encourages toddlers to imitate various animal’s motions. Kids are challenged with ‘Can you do it? scenarios. Literally from their heads to their toes, toddlers will be wiggling, jiggling, and giggling as they attempt to keep up with all the animals! The book builds children’s confidence and sparks their imagination in a fun, creative, and interactive way. 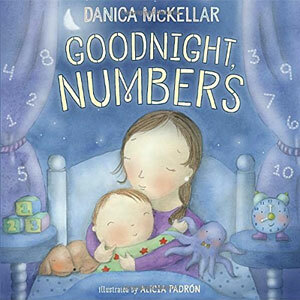 Goodnight, Numbers is a fun children’s bedtime story with a fun math twist to make your toddler smarter. Parents and caregivers around the world can ‘count on’ this fantastic educational book. 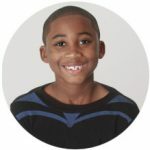 Children will have fun connecting with numbers while creating fantastic memories as they say goodnight to objects in the room. 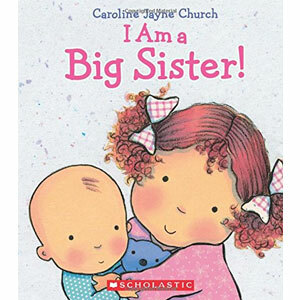 Share the joy of becoming a big sister with I Am a Big Sister! This sweet story is perfect for sharing with your loved one when expecting a new baby girl. Your girl will be the bigger sister and she will need to make adjustments as the new bundle of joy arrives in the family. Don’t forget – she, too, will need extra love and care to adjust to the changes. 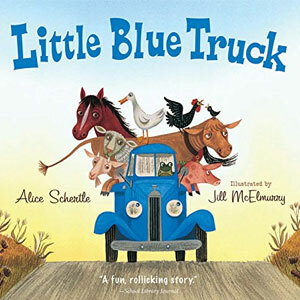 The Little Blue Truck is the story of a little blue truck who gets stuck pushing a dump truck out of the mud. Thankfully, his animal friends come to the rescue. The book comes to life with bright illustrations and kids will love repeating all the sound effects that the truck and the animals make. Beep! Beep! It’s a wonderful simple story of kindness. 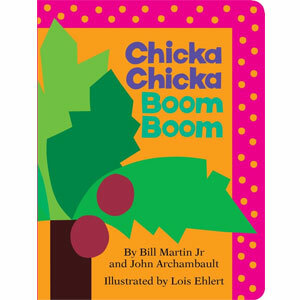 Chicka Chicka Boom Boom is a story starring the famous letters of the alphabet. You’ve never seen a story like this featuring the alphabets in an adventure you won’t soon forget. The lower case letters thought it was a good idea to meet above the coconut tree, but once everyone arrived everything went Chicka Chick BOOM! BOOM! Their family races to help. It’s a fun rhyming book featuring lowercase and uppercase letters in a fun and engaging story that will surprise little ones. This best-selling children’s book ranks as a favorite and now it’s available in board book edition. 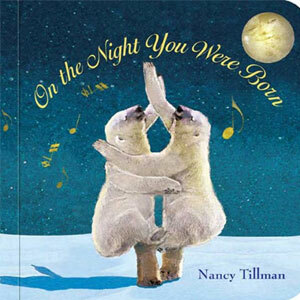 On The Night You Were Born is a masterpiece children’s book showing our loved ones they are loved. The book celebrates your one-of-kindness. There is nobody else on this Earth like you! To express love, the book says that when your child was born, the world was blessed with wonder and magic and polar bears danced. It’s a wonderful and book filled with tender love that is worth sharing with your loved one. 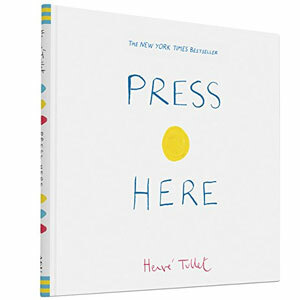 Press Here is an interactive book from Hervé Tullet. The book is a New York Times bestseller. Readers will embark on a magical journey after pressing the yellow dot on the cover and following the enclosed instructions within. Kids will interact by pressing dots, shaking pagrs, tilting the book, and more. Kids will be amazed when dots replicate, change direction, and grow. Embracing the power of imagination and interactivity, this surprising and one-of-kind book is sure to entertain. I Am a Big Brother shares the wonderful joy of being a big brother. 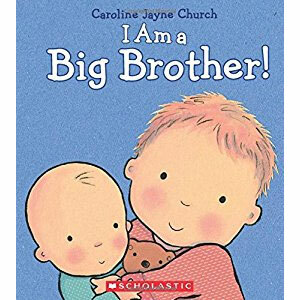 This sweet and charming children’s book is the perfect book to share with an older brother preparing for a growing family. With a new bundle of joy joining the family, big brothers need extra loving care to make the transition. With watercolor and pastel illustrations and rhyming, the book is the perfect bedtime story. 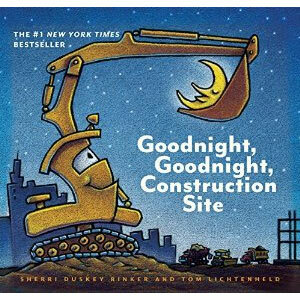 A #1 New York Times bestseller, Goodnight, Goodnight Construction Site tells the delightful story of hardworking trucks who say ‘goodnight’ before getting a good night’s rest. After all they need to get back to another day of rough and tough work. Each truck is cleverly personified with amusing details and the textured illustrations bring the story to life. This is sure to be a hit with truck-lovin’ toddlers and preschoolers with the beautiful illustrations and rhythmic rhyming text. 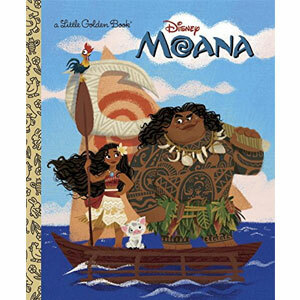 Disney Moana is a hardcover Little Golden Book. Moana embarks on an impossible mission to find a fabled island. It’s an action-packed adventure full of sea creatures, underworlds, and folklore. It’s the perfect book for Moana fans and Disney fans who have not yet discovered the story of Moana. Touch ,feel, and learn with these sensory flash cards. 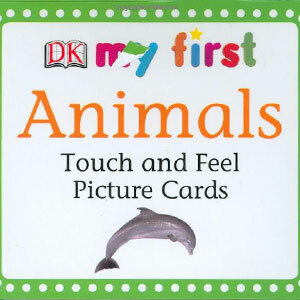 These flash cards introduce tots to animals and reading, while having fun. On each card, there is a little area where kids can pet the animals. Feel the soft skin on a sheep, parrot, horse and more. Make bath time fun with these cool gifts that go splash. Make bath time fun with the fun and excitement of Crayola’s bold colors. 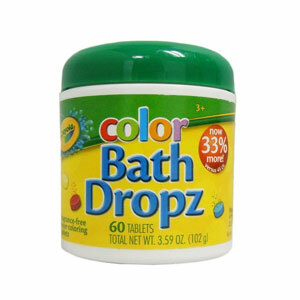 The Crayola Color Bath Dropz set contains 60 fragrance-free tablets that quickly dissolve and change the water to vivid Crayola colors for bathtime fun! What’s cool is that you can even experiment with mixing the colors to create all the colors of the rainbow! Bathtime will be super fun with this Barbie mermaid doll. Take a dive into water to see a colorful light show as her tail glimmers. She looks gorgeous with pink streaked hair and a colorful mermaid costume. To complete her look she has a maching tiara and necklace. You can even activate the light show by pressing the button on her necklace. 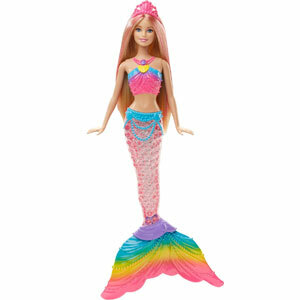 Barbie Rainbow Lights Mermaid Doll delivers magical bathtime role playing experiences. Bath time will be a whole lot more fun with these Bath Stack and Pour Bucket Rinse Cups. 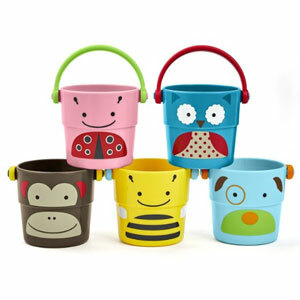 The set features 5 buckets with fun, cool zoo character designs from monkeys, bees, dogs, owls, and more.The buckets are easy for little ones to grab and they are stackable. What’s really fun are the three different sprinkle effects that make bathtime fun time! Made from 100% recycled materials, the Green Toys Submarine will deliver eco-friendly fun during bathtime. 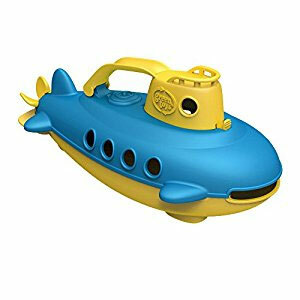 The brightly colored submarine floats well in the bathtub or pool for awesome water play. Kids can even submerge it in water for deep ocean floor missions. The toy is dishwasher safe and is safe for children, free of BPA and phthalate. These five Fleet Stacking Boats are perfect for interactive bathtime fun! 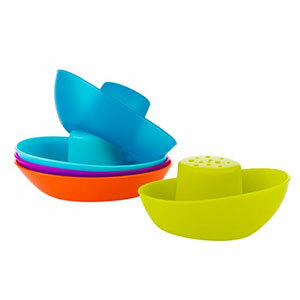 The wide boats are stackable and allow toddlers to scoop and pour water for endless water fun. There are even drain holes in the boats, creating a fun rain effect. And these bath toys are safe for baby – BPA-free and phthlate-free. These classic stacking bath toys feature fun, bright, cheerful colors to make bathtime more fun. 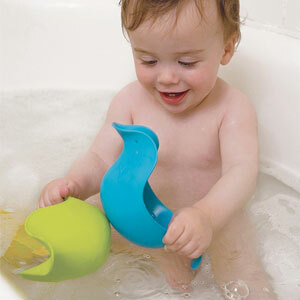 The duck-shaped bath toys may be stacked and they also can be used to pour. These bath toys are dishwasher safe and offer plenty of ways interactive ways to play and learn in the bathtub or pool. Don’t settle for a boring rubber ducky bath toy when you can have a floating baby doll that has on the cutest rubber ducky. Little kids love taking baby dolls everywhere. Now they can take one in the bath with this swimming baby floats and dives. This is a kid’s throne. 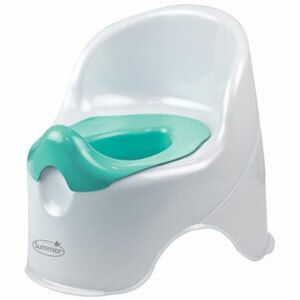 With several fun colors, the Summer Infant Lil’ Loo Potty is simply the best potty for a beginner. No fancy distractions, silly characters, sounds, or lights. The chair comes apart seamlessly, making for easy cleanup. The wider base keeps kids comfortable. The Babybjorn Step Stool is a practical solution for young kids. It allows toddlers to easily and safely reach the toilet or sink. The integrated rubber strip ensures the step stool stays in place. The stool is easy to clean and lightweight so even toddlers can move it on their own. 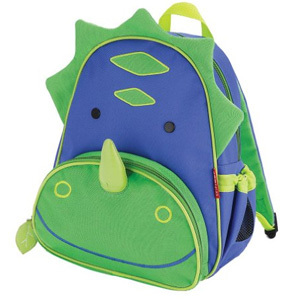 These backpacks for kids come in the most adorable animal designs from a penguin to a dinosaur to a ladybug. There are over 10 fun animal designs to choose from. These are great for preschool and toddlers. Kids will love carrying around their toys and snacks around the playground, town, or the airport. The straps are adjustable and there a pouch for a drinks on the side. Along with the big pocket, there is a small pocket with a mesh divider on the front. You can also get them with a matching lunchbox and bottle. Add a little style to lunchtime with these cute lunch boxes from Stephen Joseph. They have a zippered small pocket on the front for small books, pencils, or erasers. Unzip the lunchbox and inside there is room for utensils, lunch, and a velcro strap to secure a water bottle. With over 25 themes, it’s perfect whether you have a little dinosaur lover or pony lover. 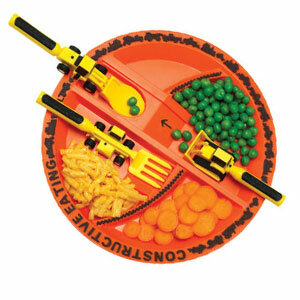 Constructive Eating offers a wide assortment of eating utencils for your toddler. The sets make eating fun for kids. They may even be motivated to eat their veggies! 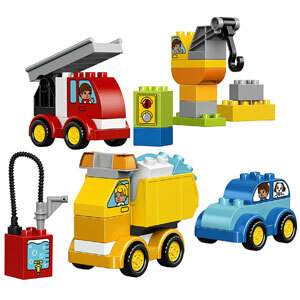 The set features a Construction Plate and 3 utencils – spoon, fork and knift shaped like cute bulldozers. The utencils can be stored in the plate after use. The plate features divided sections for different types of food. They are free of BPA, PVC, lead, and phthalate so they’re safe for kids. They are dishwasher and microwave safe and proudly made in the USA. 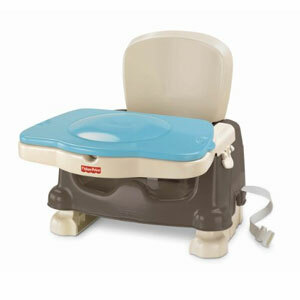 The Fisher-Price Deluxe Booster Seat is an excellent booster seat for your 2 year old. A lid keeps the surface clean so it’s ready for baby at any time. The booster seat is easy to wipe clean. And parents don’t need to worry about trapped crumbs since there are no crevices to be found. 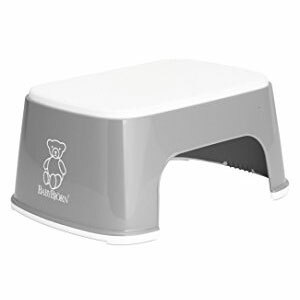 A great feature is that this booster seat grows with your child with three height adjustments. The seat straps fit almost any chair and a harness system ensures your toddler stays safely in place. The Graco 4-in-1 Covertible Car Seat guarantees a decade worth of use making it a great long-term investment for your child. It can be used in both rear- or front-facing modes. Other modes include high back belt-positioning and backless belt-positioning modes. The latch system allows for easy and quick attachment. Supports riders up to 120 pounds. Featuring a 4-in-1 convertible design, the Graco Blossom Convertible High Chair adapts to your growing child with a versatile design. It’s can transform from a high chair to infant feeding booster to toddler booster and youth chair. The innovative system even allows parents to seat two children at once – one with a toddler booster seat and the other with a youth high chair. 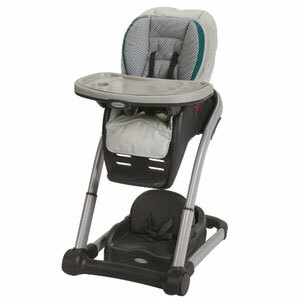 The high chair and feeding chair offer 6 height positions and 3 reclining levels for simple feeding. A one-handed removable tray adds the benefit of convenience. 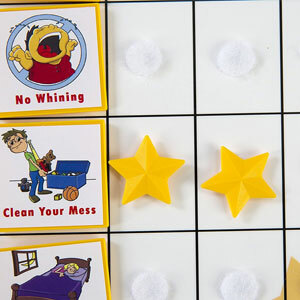 This ‘I Can Do It’ Reward and Responsibility Chart is a fun way to track and reward toddlers for completing chores and desirable behaviors. Select from over 20 chores and behaviors to focus on for your child. Easily track daily progress and work together to set goals and rewards. Toddlers will love the colorful pictures and earning golden stars. 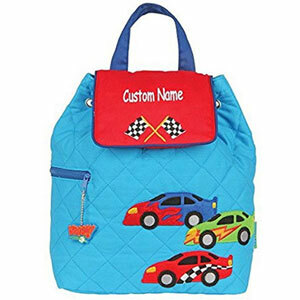 These personalized quilted backpacks from Stephen Joseph are a fun way for kids to express their style with bold colors and designs. The backpacks are available in a variety of cool styles, colors, and designs. Choose the perfect one for your toddler and customize with their name. 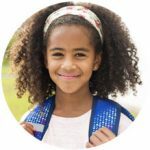 The backpacks close with a magnetic strap and drawstring closure and they are machine washable. These kids bath robes are perfect for toddler boys or girls. Styled after Prince George or Princess Charlotte for boys and girls, respectively, these are luxurious bath robes with a hood. They are super soft, cuddly, and lightweight so kids can even play in them. Perfect gift for those chilly mornings, drying off after bathtime, or drying off after swimming. 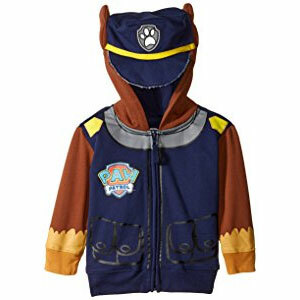 Based on the hit Nickelodeon TV show Paw Patrol, this well-designed authentic Paw Patrol Boys’ Chase Hoodie is an officially licensed product. It is designed after the character Chase, complete with his police hat and uniform. It is super soft, comfortable to wear, and machine washable with a zipper enclosure and hoodie. Fans can engage in fun imaginative role play as Chase to keep Adventure Bay community safe. It’s the perfect gift for Paw Patrol fans. 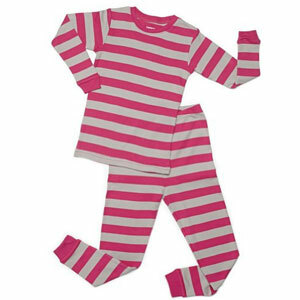 Leveret has an assortment of ‘Baby Boy’ striped 2-piece pajama set for toddlers. They are made from 100% cotton and are machine washable. They are soft and tagless, providing comfort. They are available in a variety of sizes and color schemes. Toddlers will love these cute and comfy PJs. 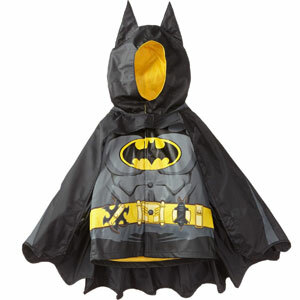 If you are look for a fashionable rain coat for your toddler, Western Chief offers a great assortment from superheros and trendy looks for any season. The rain coats feature button or snap closure and internal lining for added comfort. 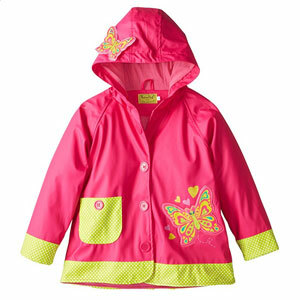 Each waterproof rain coat features a cool design to make it stand out while keeping your child dry in rainy conditions. 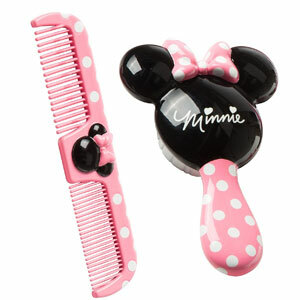 This charming and stylish brush and comb set’s design is based on Disney’s lovely Minnie Mouse character. Toddler girls will have fun brushing and combing their hair with this fun set based on their favorite character. The brush features extra-soft bristles to prevent damage to your child’s scalp and the easy-grip handle makes it easy for toddlers to grasp. The comb works on thick and thin hair as well as wet or dry hair. 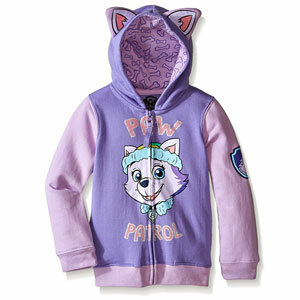 This is a fantastic and cute multi-colored officially licensed hoodie featuring Paw Patrol graphics and design. It’s super soft made of cotton and polyester and it will keep toddlers nice and cozy. Paw Patrol fans will love acting out their favorite moments from the shows. 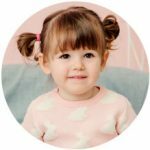 Leveret’s classy ‘Baby Girl’ Striped 2-piece PJs are super soft, made of 100% cotton so they are comfortable on your skin. They are available in a variety of different fun colors and sizes to offer a snug fit. These PJs are tagless and machine washable. Little girls will love the classy and cute look as well as the comfort. Playtime doesn’t just have to be about toys. Decorate the playroom and even your 2 year old with these wonderful gifts. LucyLews offers personalized custom vinyl wall decals to personalize your toddlers room. The decals come in a variety of sizes – 24″, 30″, 36″, 42″, and 48″ and are easy to apply. A variety of different color and font options are available to really make it your own and define your toddler’s room. Personalize your toddler girl’s room with a high quality vinyl wall decal with her name and butterflies surrounding the name. Choose from a fancy font and 25 color schemes to match your room’s décor. A different color may be chosen for the butterflies and name. Decal sizes come in 22″, 30″, and 44″. For best results use decals on smooth non-pourous surfaces. They are easy to apply and are very cute. Great way to add a personal touch to your toddler’s room. Do you have toys scattered all over the place? After playtime is over, this is a great attractive toy box for putting toys away. While it doesn’t look that big, it does hold a suitable amount of toys including stuffed animals. 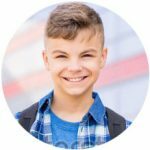 Does your child have a ton of stuffed animals? 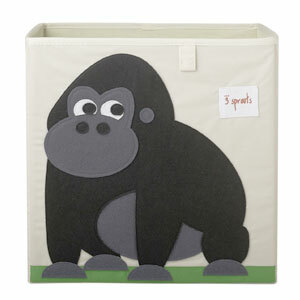 Keep them neatly organized with this Animal Bag Stuffed Animal Storage solution from Boon. It’s keeps everything neatly organized in the 100% polyester material with a see-through section. 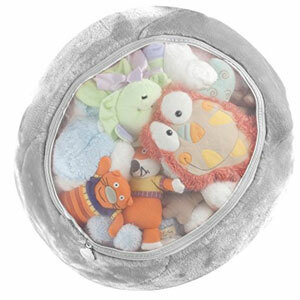 A zippered section allows you to easily remove plush toys when you’re toddler is ready to play. The product is machine washable and it’s safe for kids, free of BPA, PVC, and phthalate. 3 Sprouts makes some fun storage boxes with cute animals that serve as a perfect toy storage and organization solution for your toddler’s room. Decorated with a felt design and stiff reinforced sides, choose from designs ranging from a gorilla, alligator, fox, and more. The 100% polyester box measures 13″ L x 13″ W x 13″ D and they are perfect for most cube shelving units. 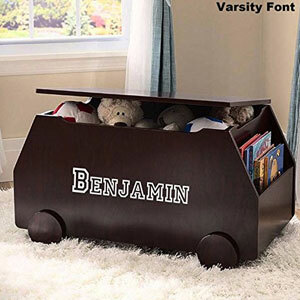 Dibsies offers personalized premium toy boxes in a variety of colors and styles to fit your child’s décor. Choose from custom fonts and colors for further personalization. The premium toy box is constructed of wood and MDF and assembly is required. A safety hinge on the lid keeps little one’s hands from getting pinched. It features sturdy construction for an organized solution that will last for years. Some toy box designs double as a bench for toddlers. Looking for a toy storage solution? 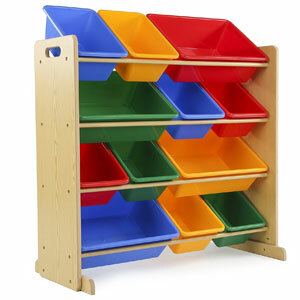 Tot Tutors offers a great toy storage organizer with durable wood construction and plastic totes in a variety of colors. 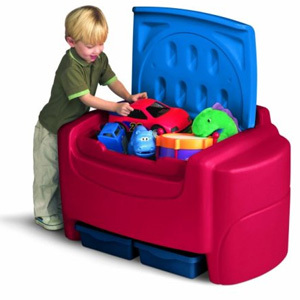 The organizer is easy to assemble and really helps keep toys well organized. When kids are done playing they can easily place it back where they found it. Multiple color options are available. Find the one that best works for your toddler’s room. 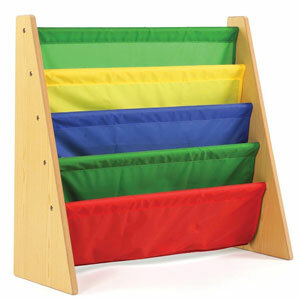 The Tot Tutors Book Rack Storage is an excellent storage solution for your toddler’s book collection. The colorful design will appeal to children and kids will be able to easily see and grab their favorite books. The wood is durably constructed and built to last. Book storage rack measures 25″ W x 24″ H x 11″ D and is available in multiple color options to fit your needs. 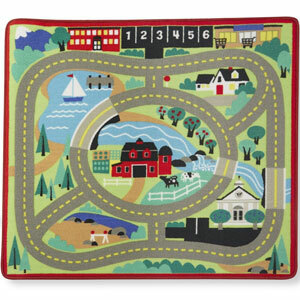 Measuring 39″ X 36″, this colorful square shaped play mat features an entire town for driving around with winding roads. 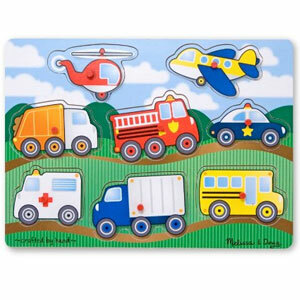 Round up all the toys, this play mat offers hours of fun for kids to play on with their toys. While it includes 4 wooden cars, almost any vehicle with wheels can be used. The beautiful image on the rug is woven and not printed, so it won’t wash away. At about 6 feet long and 3 feet wide, this imaginary city is large enough for your child’s imagination. The carpet is big enough for 2 people to play with. When you are done, it rolls up just as easily. With numerous streets and buildings, it’s perfect for driving little vehicles around. Your little one will love driving around town as their imagination takes them to new places. 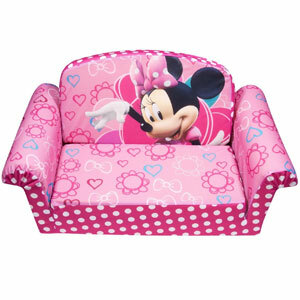 What better way to relax than in this adorable Minnie Mouse themed little sofa designed just for your little one. It’s perfect for an afternoon of reading or watching TV. Flip open the sofa and it is time for nap time. 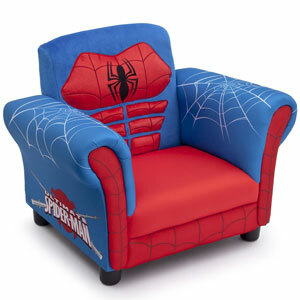 Your little web crawler with love lounging in this Spider-man themed chair designed just for him. 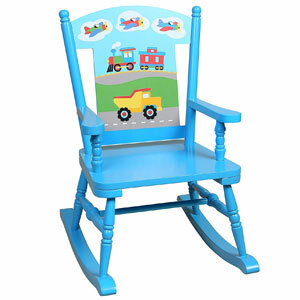 With bright and colorful colors, he will love reading, watching tv, and maybe even crawling on it. Make projects, meals, or playtime fun with this table andchair. The chairs are designed to support children up to 50lbs. Made of solid wood, this beautiful bold and colorful table comes in a variety of fun themes including Sesame Street, Mickey Mouse, and more. Now this is one awesome and large stuffed animal! Meet this giant giraffe. It stands an incredible 4-feet tall and features life-like realism. 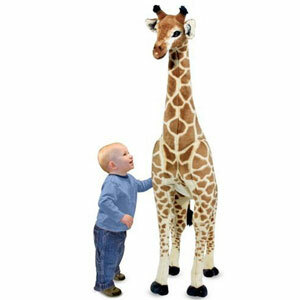 Toddlers will have larger-than-life experiences with this fascinating plush toy. Here is a fun twist on the night light. 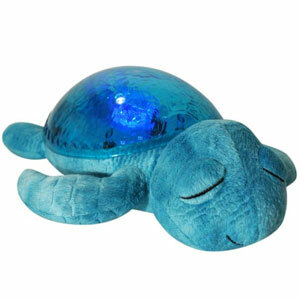 This turtle literally shoots underwater effects on your walls and ceiling at night, helping your little one go to sleep. There is something magical about falling asleep under calm waves. What kid doesn’t want a horse? 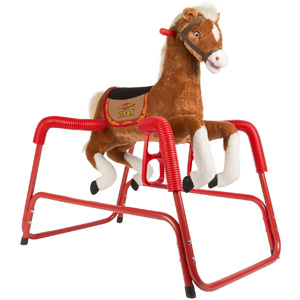 Your little cowboy or cowgirl will be yelling yee-haw as they ride on top of this huggable spring horse. Press his ear and the toy comes to life singing and talking. Constructed out of steel, the base is sturdy and the springs are covered. This DIY Vinyl Growth Chart Ruler Decal Kit from Little Acorns is easy to apply to your wooden ruler. The decals feature a vinyl, matte finish with 72″ of measuring lines. Choose from 15 different colors. They’re great because they are durable and don’t peel over time and they are proudly made in the USA. This wonderfully designed Flower Blossom Tree of Life wooden growth chart is the perfect addition to your toddler’s room. Have fun tracking their growth progress over the years. 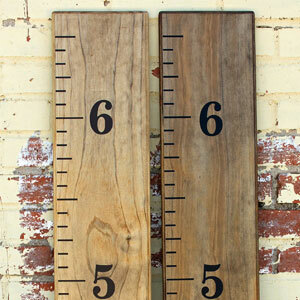 This wooden growth chart is designed to last and can serve as cherished memories when your child grows up. 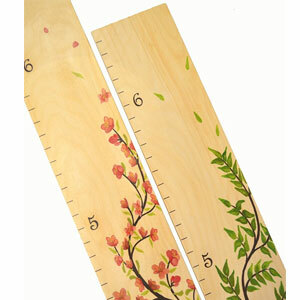 Growth chart measures 58″ H x 5.75″ W and is proudly made in the USA with the greenest materials. 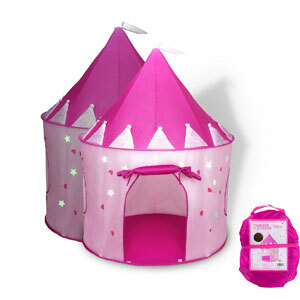 This princess castle is an excellent gift for little princesses. The glow in the dark stars are sure to inspire your toddler’s creativity and imagination. It’s easy to assemble and it features an innovative foldable design. It’s the perfect place to relax and dream away. 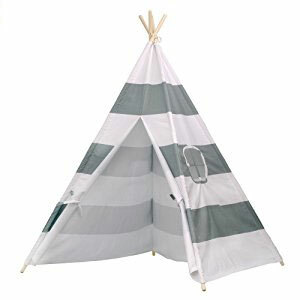 This Teepee Play Tent is perfect for imaginative play. It’s easy to assemble and great for indoor or outdoor play. It’s made from durable wooden parts and cotton thick canvas so it will withstand daily use. A handy pocket is featured on one side of the inner tent, allowing storage of light books or soft toys. A great set for sparking the imagination or playing hide-away. Available in an assortment of different colors and styles. 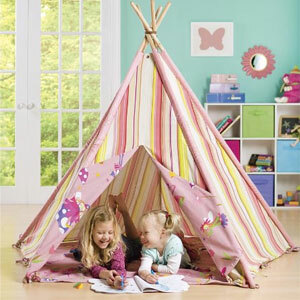 The Fairy Playtime Teepee is a fantastic set for playtime! 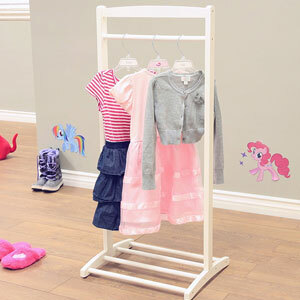 It’s made from sturdy wood and 100% cotton canvas for long-lasting fun. It has a removable ground mat, flap door and window for fun, imaginative play. Perfect for indoor or outdoor fun! 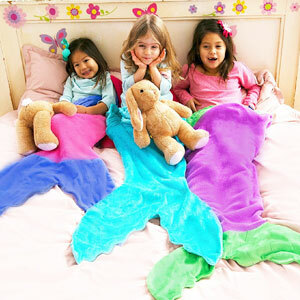 Blankie Tails Mermaid Tail Blanker is the hottest kids blanket on the market. They are made from super soft plush-like premium material. They keep girls warm and cozy with a stylish mermaid design. Girls can put their feet all the way into the mermaid tail. They are available in a variety of gorgeous colors. The toddler size is perfect for kids ages 1-4. The blanket measures 24″ x 37″ and it is machine washable. Perfect gift for sleepovers, camping, and more. Blankie Tails are all the rage nowadays. 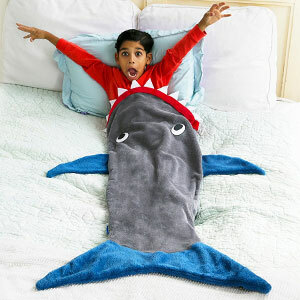 This Blankie Tail features a shark blanket design with soft felt teeth, fins, and tail. The blankets are super soft and comfortable, made from premium materials. Kids can put their legs all the way into the tail and they keep you warm and cozy. Perfect for camping and sleepovers. Available in assorted colors. The Olive Kids Rocking Chair features wonderful kid-friendly designs with bold colors and a variety of designs to complement your room. With fun, playful designs and high quality, it’s a great statement piece for your toddler’s playroom. For toddlers who are fascinated with Walt Disney’s Minnie Mouse, this Disney 4 piece Minnie Mouse Toddler Bedding Set is perfect. The set is made from a combination of cotton and polyester. It is made from polyester microfiber, providing warmth and comfort. It’s a complete bedding set with a comforter, top sheet, fitted sheet, and pillowcase with official Minnie Mouse graphics. 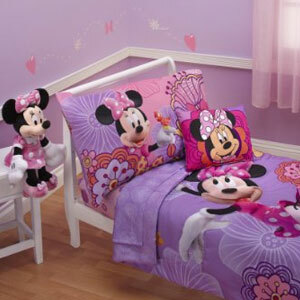 Fans will love this Minnie Mouse theme in their room. Minnie Mouse fans will love this lovely toddler pillow featuring their favorite character. It’s made of 100% polyester fleece and machine washable. 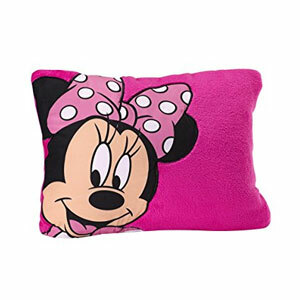 This hot pink decorative pillow featuring Minnie Mouse in her famous polka dot ribbon measures 12″ L x 16″ W.
Paw Patrol fans will love these decorative pillows designed with their favorite Paw Patrol characters. They are made from soft plush material for the ultimate in comfort. They are perfect for relaxing, resting or sleeping. 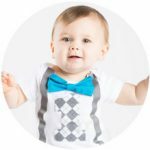 They are safe for toddlers with embroidered details and made of 100% polyester. 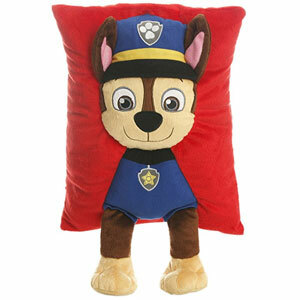 The pillow measures 15″ H x 10″ W. The perfect gift for Paw Patrol fans. If you’re looking to add a toddler bed to your child’s room, Delta Children offers a great selection featuring some of their favorite characters and shows. 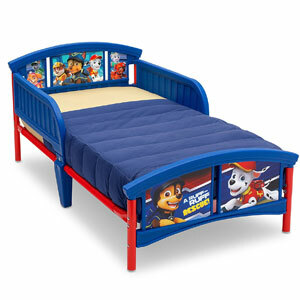 Their toddler beds feature two guardrails, headboard, and a sturdy steel frame. They feature officially licensed graphics from some of the hottest properties, including Paw Patrol, Disney Pixar Cars, or Disney Princess. In all, 14 different styles are available. They are easy to assemble and meet or exceed safety standards, hold up to 50 lbs., and measure 54″ L x 29″ W x 26″D. With a practical, stylish, and functional design, this Frenchi Kid’s Clothes Hanger will allow parents to complete their child’s room and keep the room neat and tidy. Assembly is quick and easy and it is available in a variety of colors to match your room’s décor. Perfect for hanging suits, dresses, and other articles of clothing. 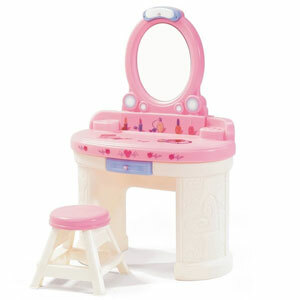 Your toddler will love this Fantasy Vanity so they can engage in fun imaginative and imitative play. Now your girl can be just like mommy. The vanity set features a high-quality, shatter-resistant plastic mirror, lights, and matching stool. Molded compartments and pull-out drawers store make-up and accessories and a 3-piece accessory set with hand mirror, brush, and comb adds to the compelling and fun experience. Best Toys For 2 Year Olds? What do you think are the top toys for two year olds? Let us know in the comments. Want to see even more cool toys? 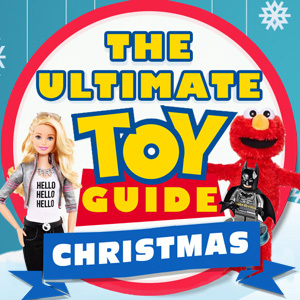 Check out our most popular Gift Guide on the best christmas toys 2017.